This post was sponsored by Italian Wines USA. All opinions my own. 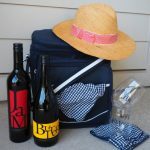 I love wine, but I admit to being a bargain hunter when I buy it—unless it’s a special occasion. For example, I’m always excited when I get to travel to a new locale because that means experiencing it through special food and wine. 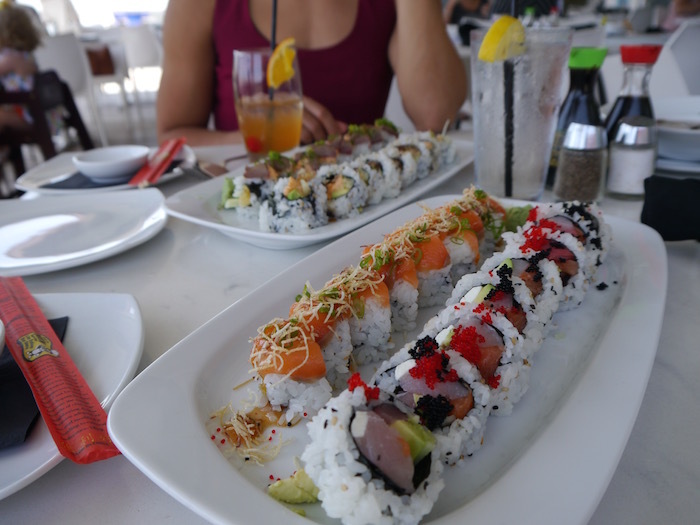 But as I’ve traveled more, it’s become clearer to me that life is too short not to treat yourself regularly. After all, isn’t life kind of a special occasion in itself? I took my own advice this past weekend. In preparation for a looming snowstorm where I live, I headed out to pick up a few snowstorm essentials, including a bottle of Cabernet Sauvignon-Sangiovese from Tuscany, one of Italy’s 20 wine regions. I picked a Tuscan wine because I’ve always wanted to visit Tuscany since seeing the movie Under the Tuscan Sun years ago. Gotta love Diane Lane! 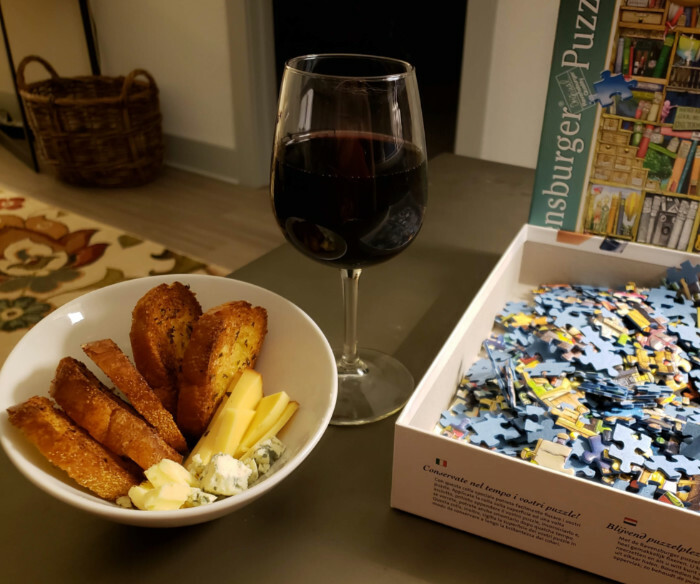 I felt a little guilty putting together such a nice looking cheese plate for just me, but I’m taking my own advice and treating little moments—like being snowed in—as if they were special occasions. I poured myself a glass of the Cabernet-Sangiovese Italian wine, sliced and toasted some baguette with olive oil and herbs. I set out some cajun cheese curds, gorgonzola, smoked gouda, and aged cheddar. And I sat down for a super chill night in with the new puzzle I got for Christmas. The wine was absolutely delicious. It had deep, complex flavors that I’ve really been missing out on with my usual wine purchases. I did a little research into Tuscan wines and learned a few interesting facts. Apparently, there’s a kind of wine known as “Super Tuscan”! A Super Tuscan wine is a red blend made with grapes grown in Tuscany but that are not indigenous to Italy. It can include Sangiovese, Cabernet Sauvignon, Merlot, Syrah, and/or Cabernet Franc grapes. Actually, I think that means the wine I picked out is a Super Tuscan. Cool huh? To find a Super Tuscan, there are a couple of things you can look for on the label. It will say Toscana, meaning it’s from Tuscany, and will say Indicazione Geografica Tipica underneath that. Also, a Super Tuscan wine will usually have a special name, rather than saying what kind of grapes it’s made from. It was fun treating myself to a night in with a bottle of Italian wine. From now on, I won’t feel guilty about opening a bottle like this when it’s not a typical “special occasion”! To learn more about Italian wines, visit the official Italian Wine website here! 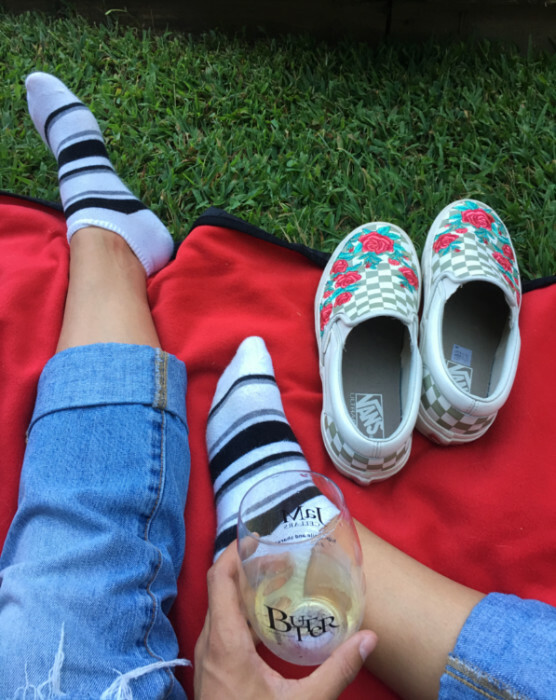 This post about wine and music pairings was sponsored by Cambria Winery as part of an Influencer Activation for Influence Central and all opinions expressed in my post are my own. Whenever I drink wine (often) and whenever I visit a winery (also often,) I enjoy the music playing in the background. There’s something about music that enhances the wine tasting, the conversation, and the experience as a whole. It just goes together, don’t you think? For the record, music goes well with a cold beer too, but a different musical genre, for sure. 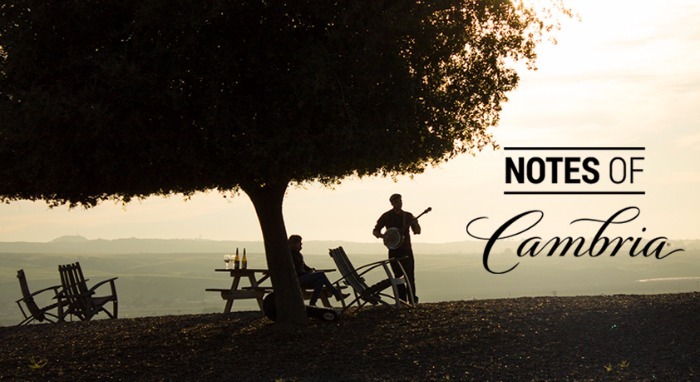 Cambria Wines is onto something extraordinary (besides their delicious Santa Maria Valley-grown wine) with their innovative Notes of Cambria wine and music pairings. They created a 4-part video series (each video is about 2 minutes in length) and it shows how pairing wine and music elevates the wine tasting experience in a brand new way. 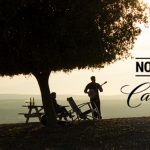 Cambria Wines challenged the ultra-talented musician Kalei Yamanoha to create musical pieces that evoke the very essence of two of their estate grown and bottled flagship wines: Cambria’s Benchbreak Chardonnay and Cambria’s Benchbreak Pinot Noir. If you watch the videos, I think you’ll see how brilliantly the music captures the flavor profiles, from opening sip to fluid finish. When I listened to “Chardonnay Shanty”, it made me feel light, energetic and happy — just what I would imagine in a crisp, white wine. I imagined my little family playing board games while sipped our Cambria’s Benchbreak Chardonnay on the back deck of an ocean front cottage. When I listened to “Pinot Noir Waltz”, I envisioned it being part of our upcoming fall decorating and baking party. The music seemed to echo how the wonderful fruity notes of Cambria’s Benchbreak Pinot Noir cling to the palate as they develop their full flavor. If you’ve never thought about wine and music pairings before, I hope you’ll take the opportunity to listen to the Notes of Cambria series while enjoying this high quality, immensely flavorful wine from California’s Santa Maria Valley wine region. The musical pairings are a wonderful way to experience, learn, talk about and explore wine, so use this store locator to find Cambria’s Benchbreak Chardonnay and Cambria’s Benchbreak Pinot Noir and invite your family and friends over for a true five senses experience. 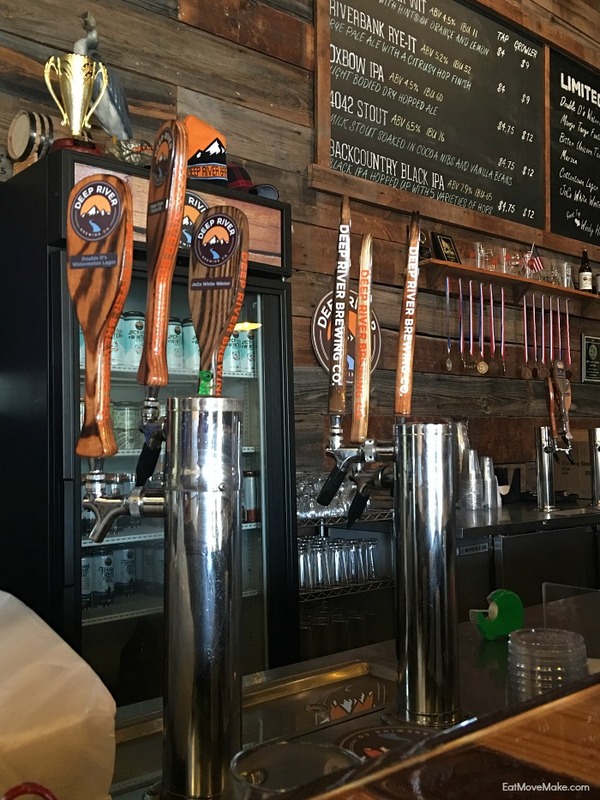 If you’ve traveled along I-95 or I-40 on your way to and from Carolina beaches or outlet centers, you may have passed through Johnston County without realizing it, and now there’s a good reason for you to stop over – the Beer, Wine & Shine Trail. Johnston County, NC (affectionately known as JoCo) is the only place I know of to combine beer, wine and shine into a single trail, because they’re lucky enough to have all three being produced within county lines. And that’s something to celebrate… with some sippin’. 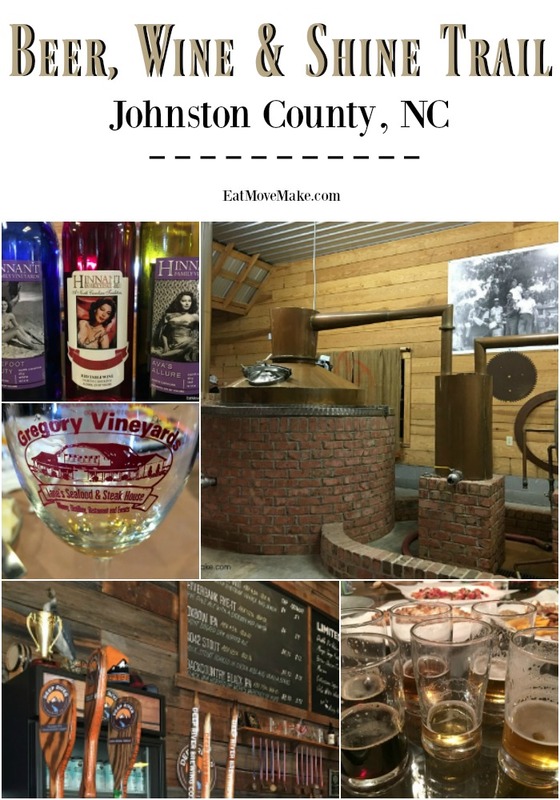 I hopped the Beer, Wine and Shine Trail as a guest of Johnston County. 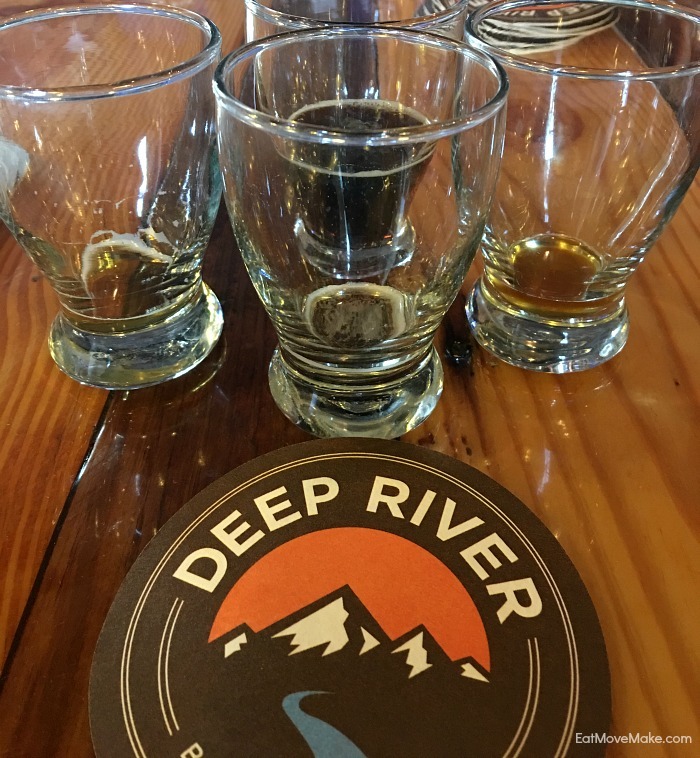 Deep River Brewing Company (Clayton) – Johnston County’s first legal brewery sits inside a historic cotton mill. It’s cozy and inviting, and I loved it the moment I walked in. The taproom is absolutely beautiful! The bar and wall behind it are made with reclaimed wood from an old tobacco shed, and the brewery vibe is very family-friendly. 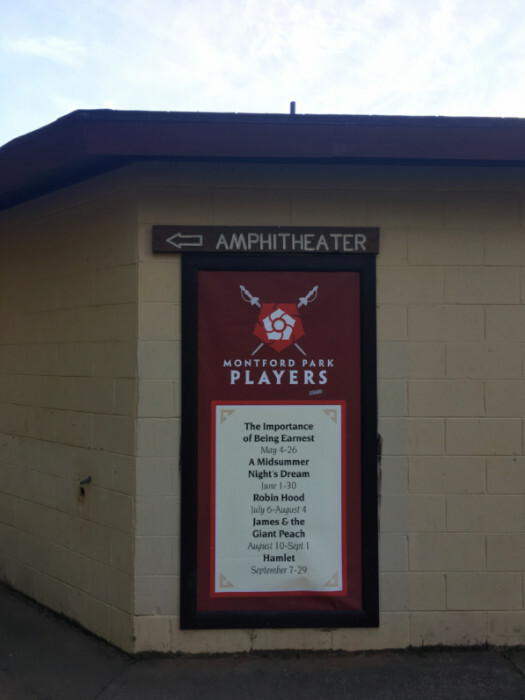 Deep River patrons can enjoy weekly live music and food trucks. 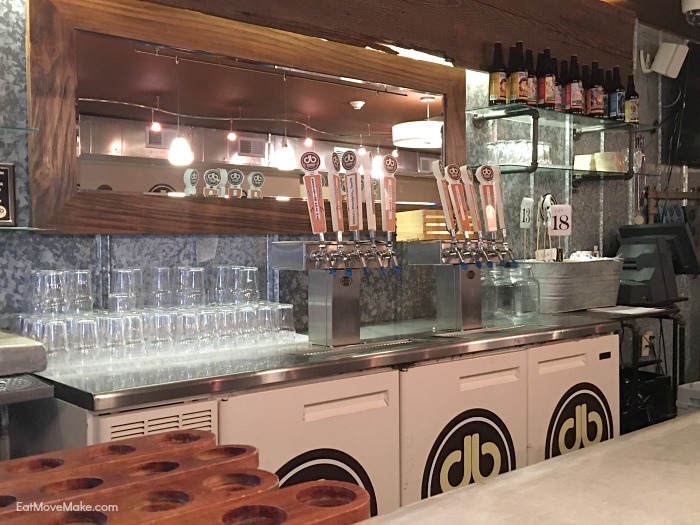 Double Barley Brewing (Smithfield) – Owner Cheryl Lane gave her husband, Larry, a beer brewing kit for his 40th birthday, not knowing it would result in their opening a brewery just two years later! The taproom decor is modern meets rustic with plenty of reclaimed wood, and the brewery boasts a cozy beer garden as well. 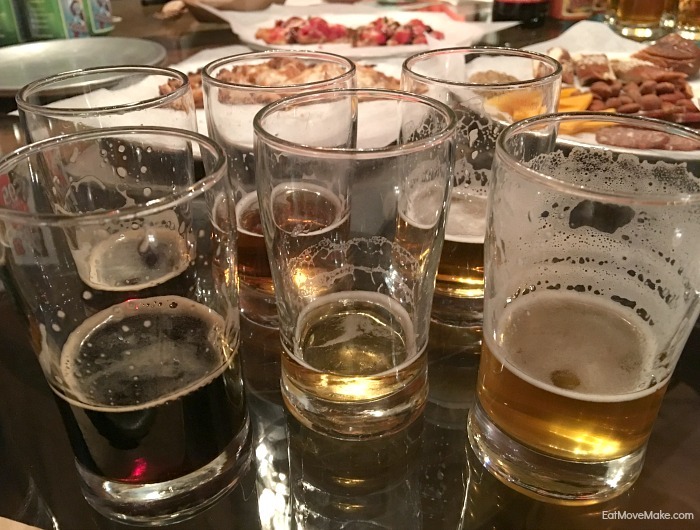 The majority of Double Barley beers are “big beers” meaning high APVs, so they also serve eight different menu items for patrons to enjoy along with their brewski. The most popular beers on tap right now are the Revelation Pale Ale and the Abby’s Amber. It’s all about the muscadine grape in North Carolina, and admittedly, it’s a grape I don’t much care for. It produces a sweet wine, and I like dry wines. That being said, it’s always fun to taste, and every winery manages to surprise me with at least one wine I enjoy within the varietal. 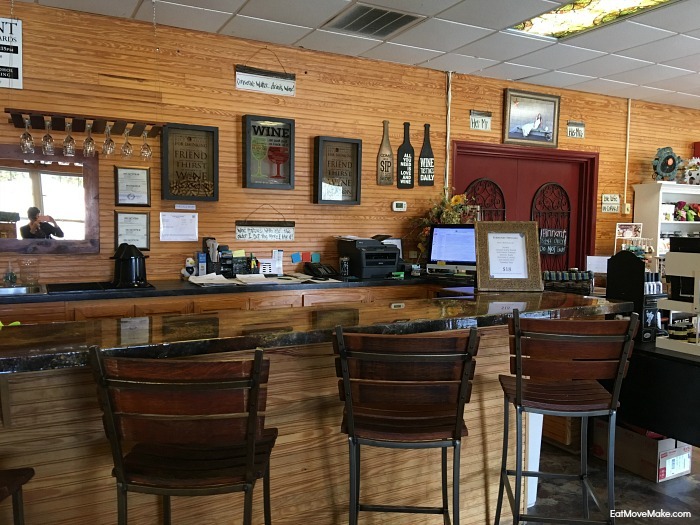 Hinnant Family Vineyards and Winery (Pine Level, NC) – The vineyard began in 1971 to plant vines and sell grapes to market, but 14 years ago the family decided to start the winery, and the vineyards have since grown from the original 16 acres to 100 acres. It’s the largest muscadine winery in North Carolina, but they do grow a hybrid blanc du bois grape as well. 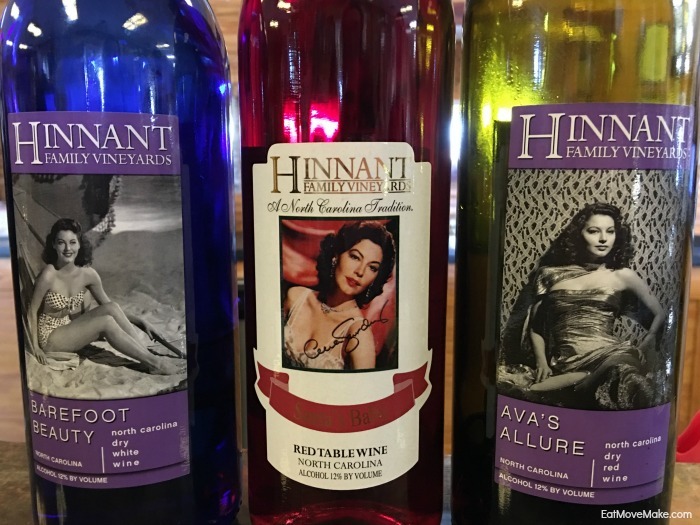 Having just visited the Ava Gardner Museum, it was fun to see the three wines celebrating the Hollywood legend: Barefoot Beauty, Santa Baby and Ava’s Allure. 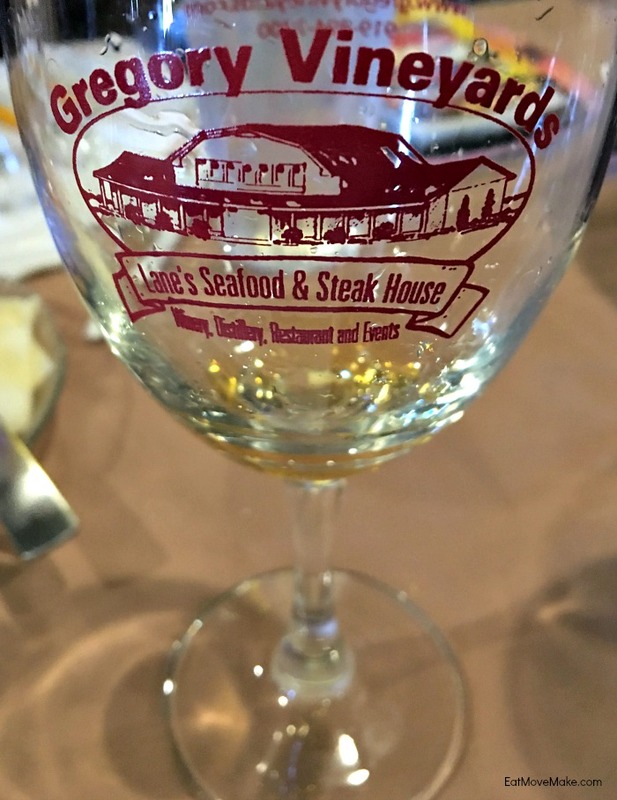 Gregory Vineyards (Angier) – Owners Lane and Teresa Gregory are about the sweetest couple you’ll ever meet. 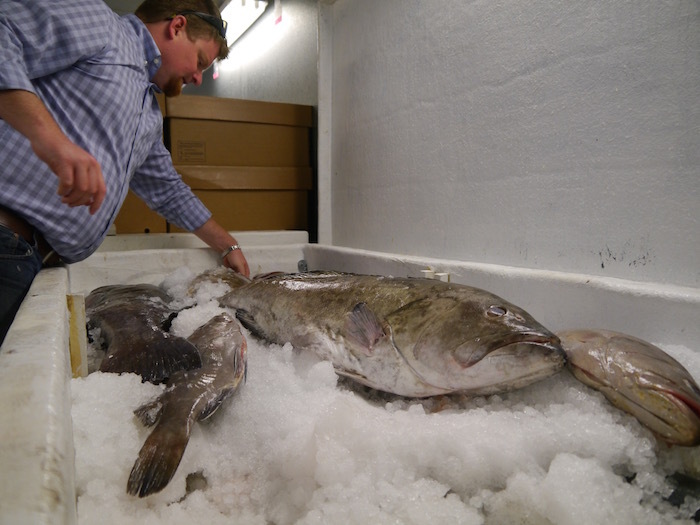 Lane started out tobacco farming, and when that industry changed, he opened a restaurant. Twice he leased it out over the years, but it never thrived when not under his care, so he finally took it back for good. 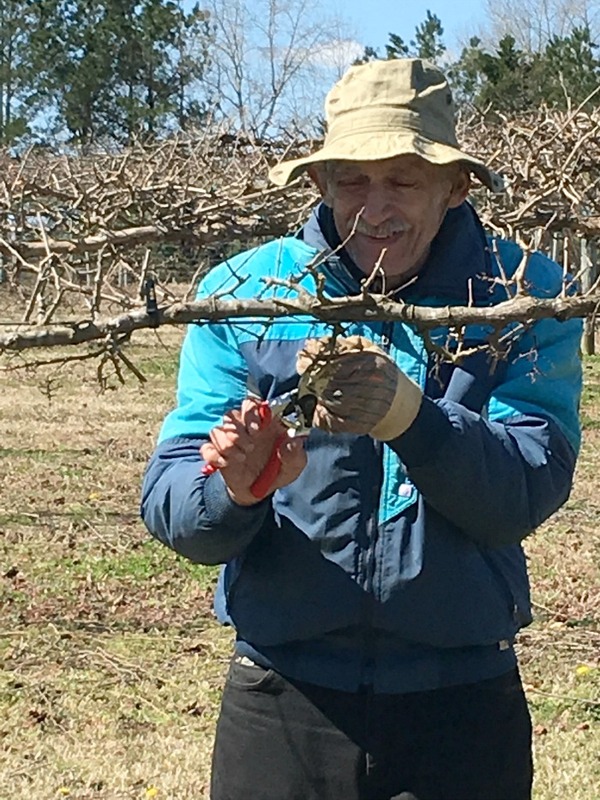 When they started doing weddings, Lane planted vineyards for a beautiful backdrop, and a couple years later he opened a tasting room and began making muscadine wine as a hobby. It went over so well that they’ve expanded by 20 or 30 acres, and Gregory Vineyards is now producing 67,000 bottles per acre. All of the wine they sell comes from their own vineyard. 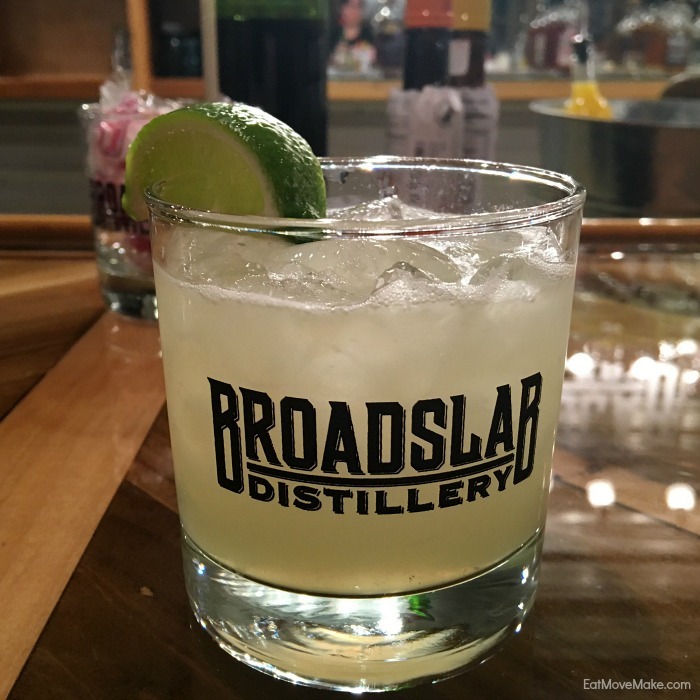 Broadslab Distillery (Benson) – Jeremy Norris, owner and master distiller, grew up in a moonshine-making family. 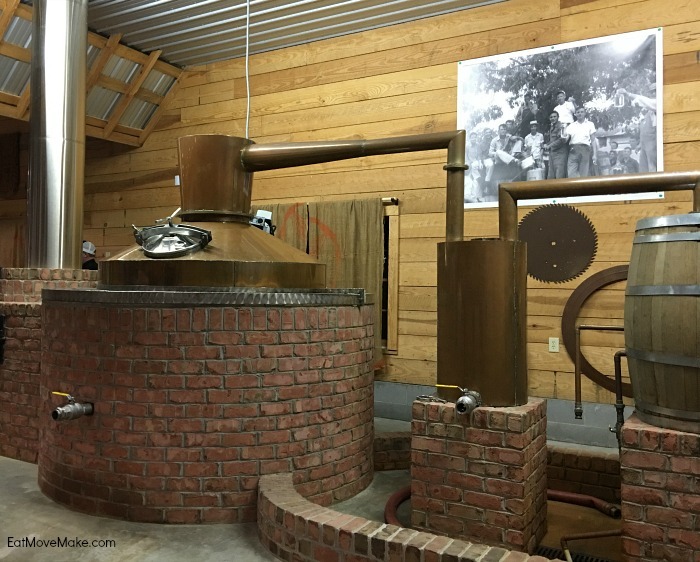 His granddaddy had his own still by the age of 13, and the extremely smooth “shine” Jeremy distills today is a direct result of five generations of whiskey distilling expertise. It’s an ultra smooth moonshine aged in oak with no artificial colors or sweeteners. Jeremy is a one man moonshine show too. 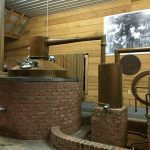 He does it all from dirt to bottle: growing the corn, harvesting, graining, mashing, distilling, bottling… and he’s fastidious about every single step of the process because “you can taste the difference”. This is as craft as it gets, and it’s good stuff, let me tell ya. 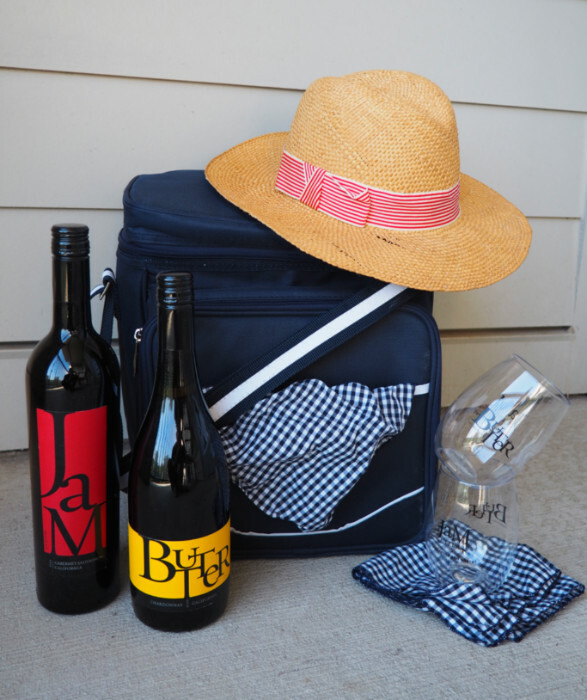 What’s your favorite for sippin’ – beer, wine or shine? 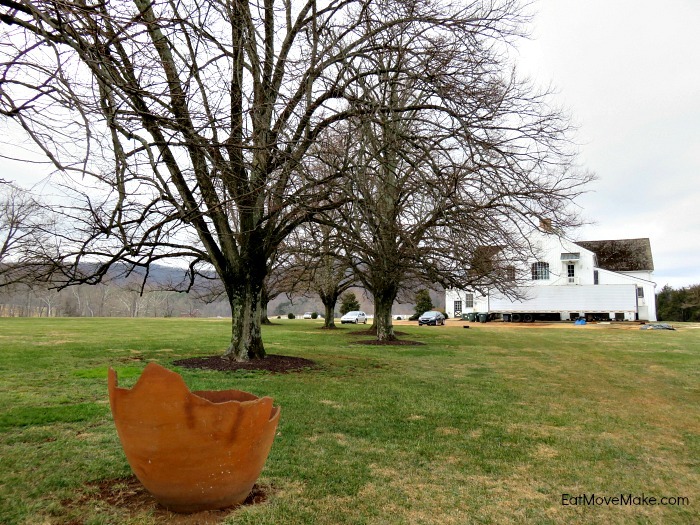 Charlottesville Virginia | Make It a Girlfriend Getaway! 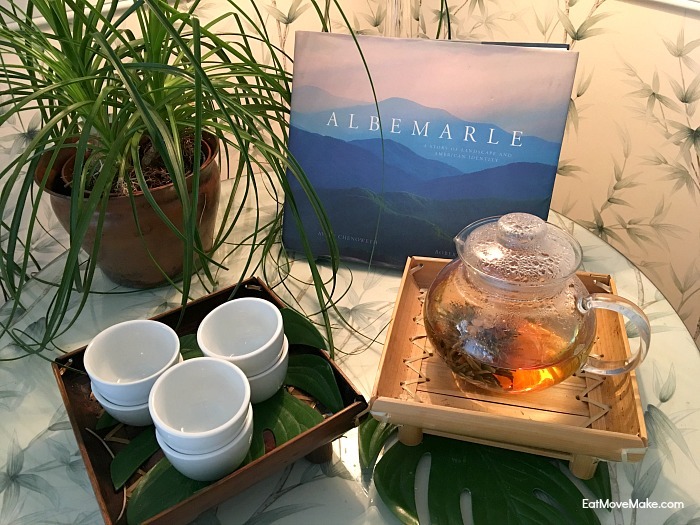 Starting with its perfect location in the rolling foothills of the Blue Ridge Mountains, beautiful Charlottesville Virginia is a destination not to be missed. 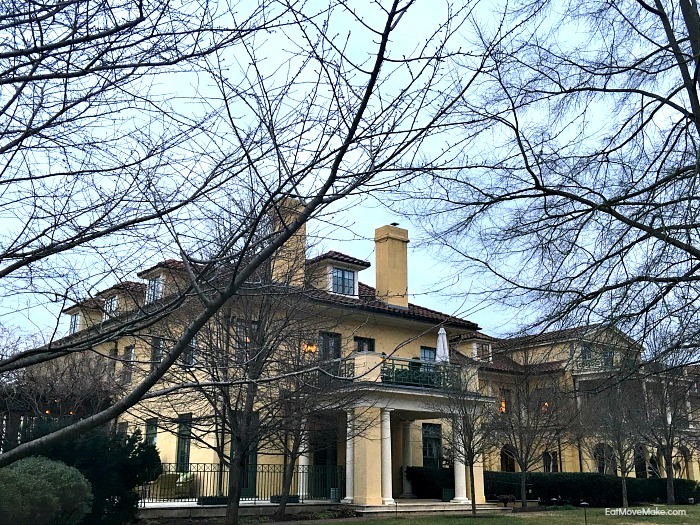 Charlottesville marries the stately elegance and history of countryside presidential estates with a thriving food, arts and cultural scene in the lively university and downtown mall area. 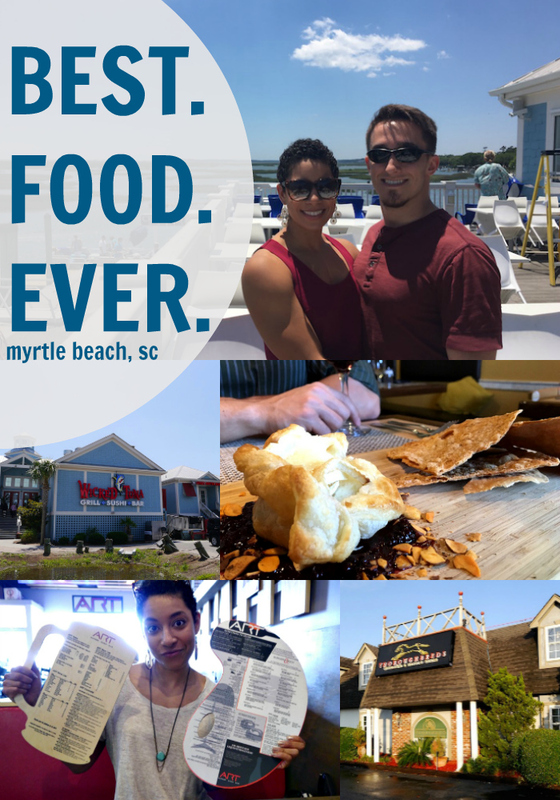 It truly is the best of everything, and a surprisingly wonderful place for a girlfriend getaway. 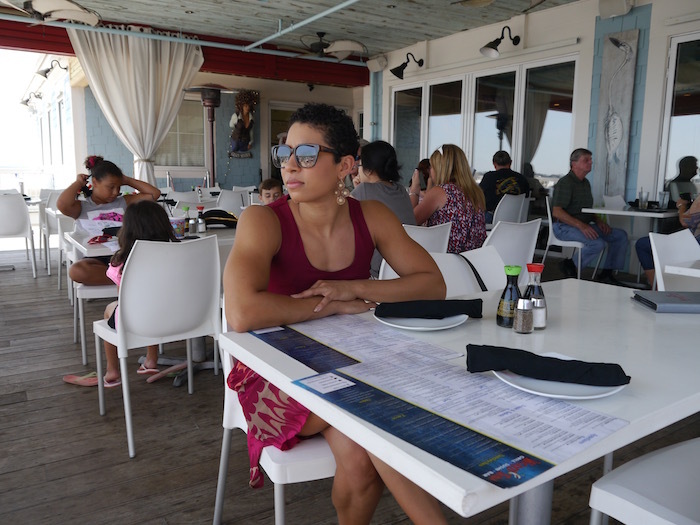 Pondering a girlfriend getaway? 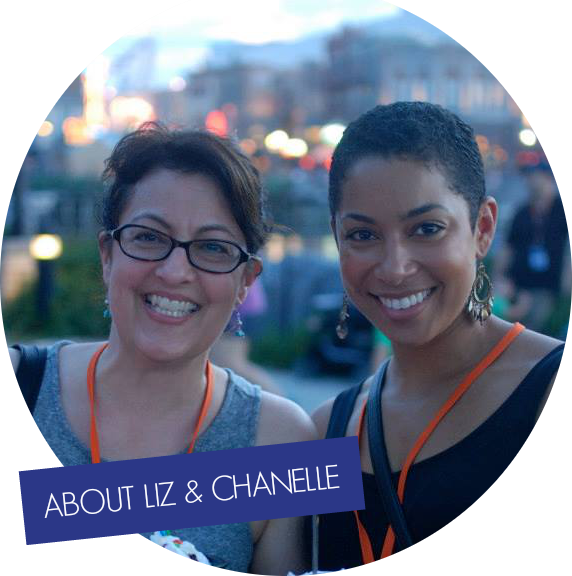 Then here are some ideas on what to do in Charlottesville VA with your gal pals. 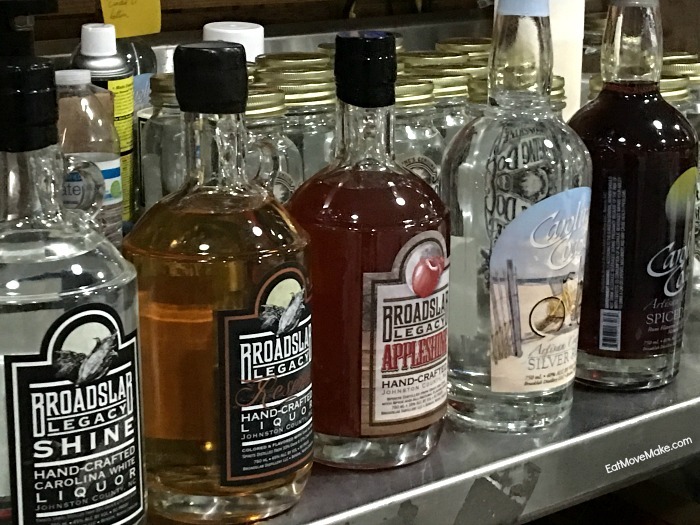 Forget your sweet fall favorites for a minute, because Castle Hill Cider serves the hard stuff and it is good! 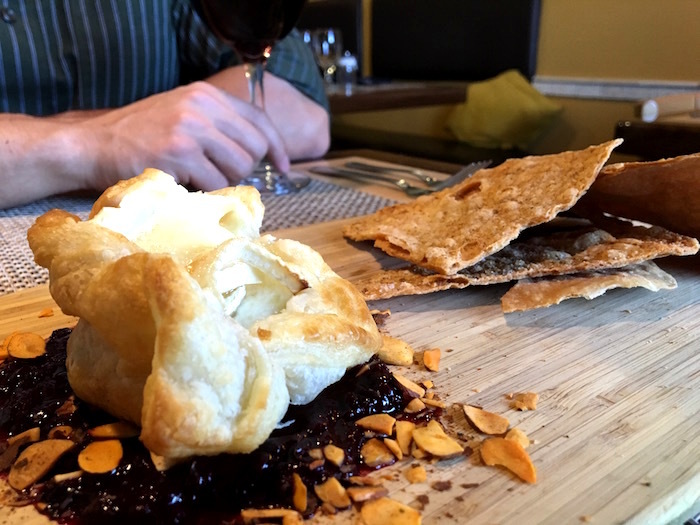 If your tastes lean toward the dry, rather than the sweet, you’ll absolutely love it. My pick: Terrestrial. 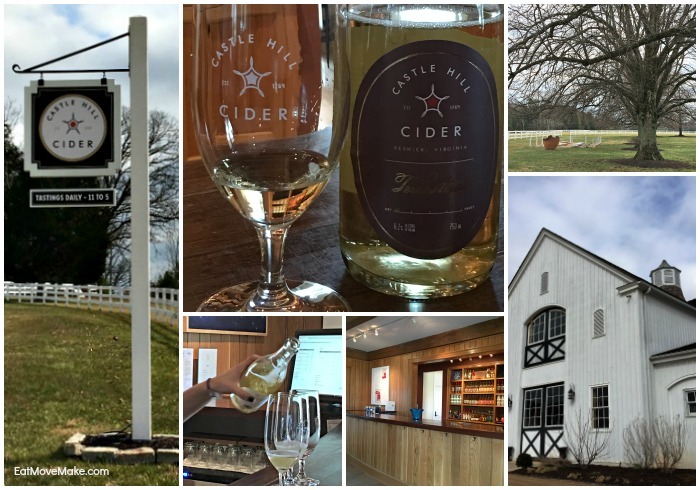 Located on the historic 600-acre Castle Hill estate in Keswick, the cidery not only makes delicious dry aged ciders, but they have the distinction of being the only cidery in the world to be aging cider in a qvevri. What’s a qvevri? 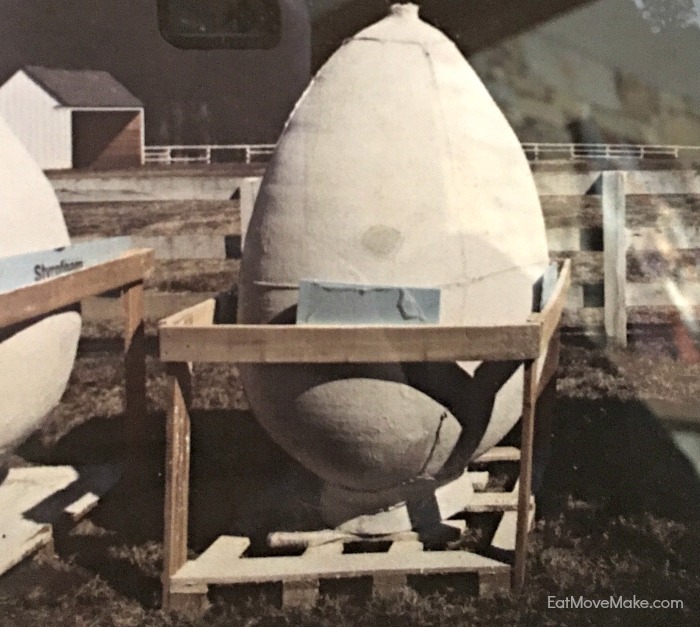 It’s a large terra cotta egg-shaped vessel and the first traceable and purposeful method of underground fermentation and storage. 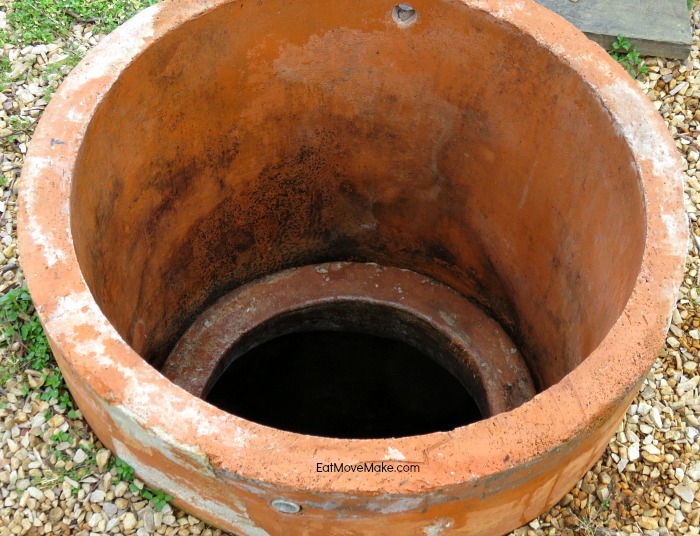 There are eight of them underground and in use at Castle Hill. 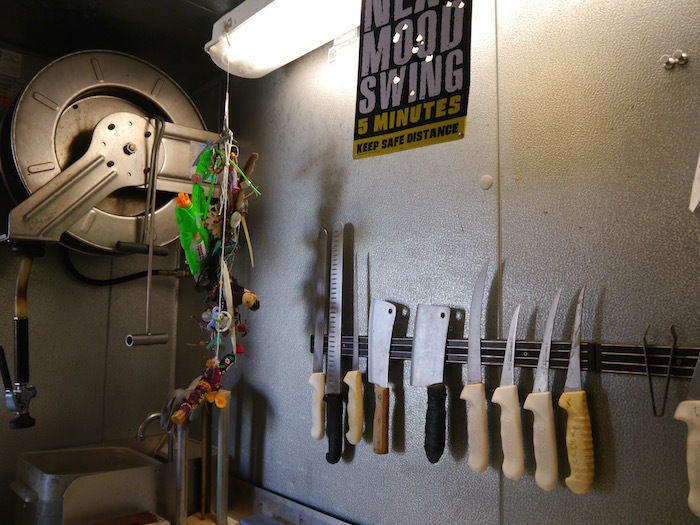 When in fermentation mode, these are cleaned, sanitized, sealed and locked. We got a peek between uses. Seeing this broken qvevri up close helps you get perspective on the size. 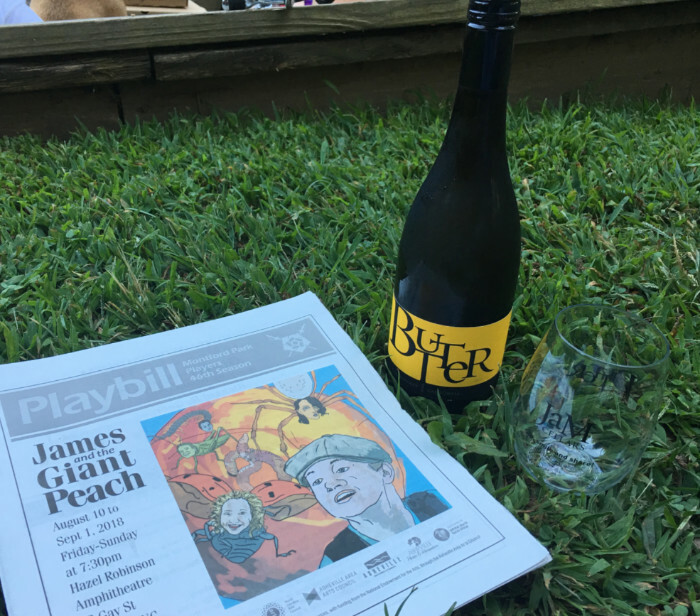 Be sure you taste the Levity, one of the qvevri-aged ciders when you visit the tasting room, and take a stroll around the grounds if you can. It’s beautiful there! 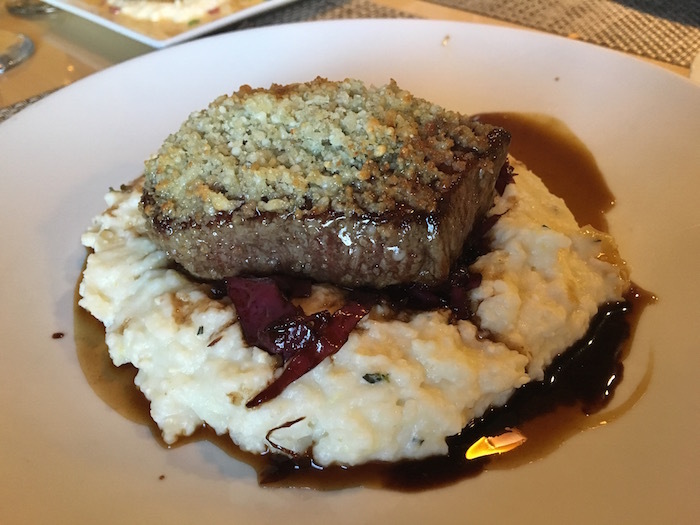 A visit to this cozy tasty room at Keswick Vineyards is well worth your time. 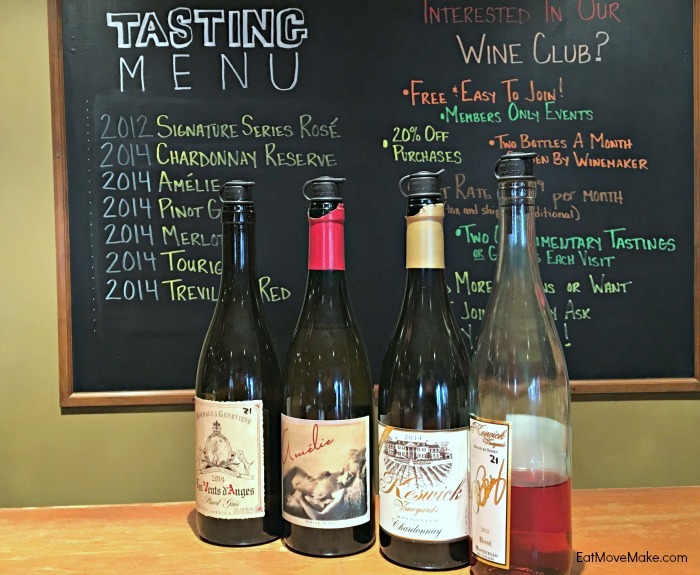 The wine style is primarily dry with fruit-forward notes, so whether you prefer dry wines or not, you’ll likely find a wine you love. They grow 12 different varietals on the property, so all but one wine (the Pinot Grigio) are produced with their own grapes. According to their wine expert, the most popular white is Chardonnay (I loved it!) 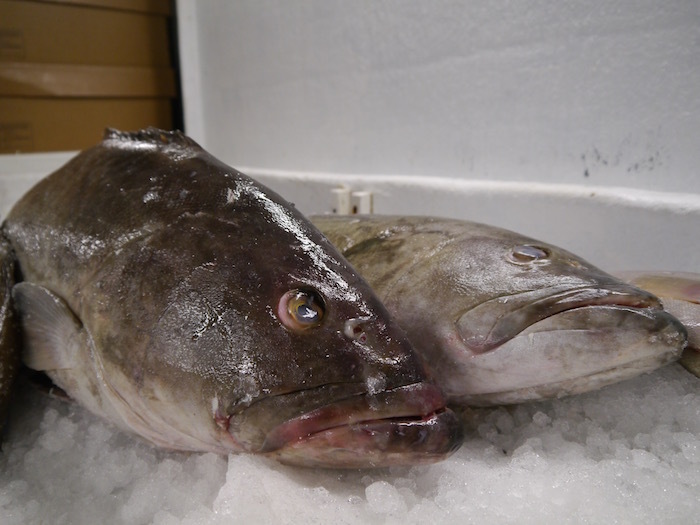 and the most popular reds are Merlot and Trevillion Red. Fun Fact about the Amelie (pictured above): Amelie Reeves was one of the original descendants of the estate and the label is a charcoal self-portrait she made at age 24. The wine itself is stainless steel aged so it has a bit of an acidity, burn and crispness to it, just like Amelie herself did. Apparently she was a bit of a firecracker. 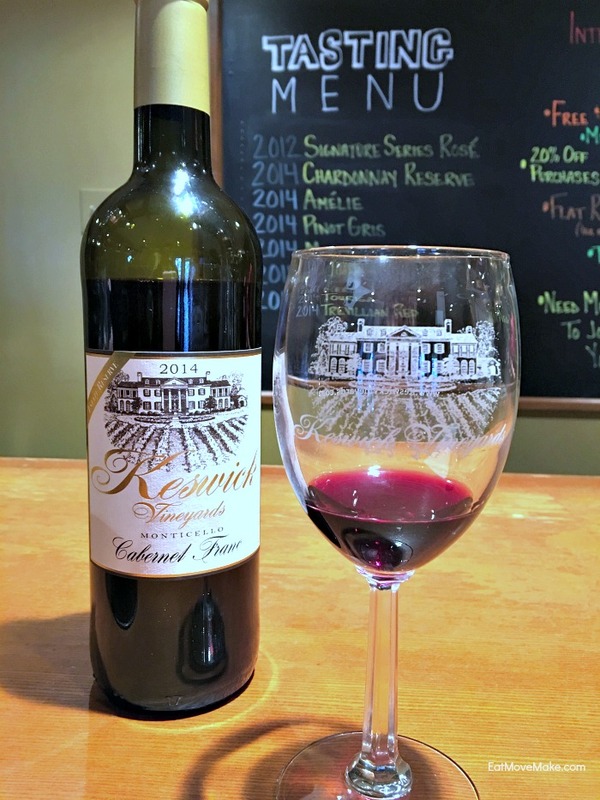 We happened to visit Keswick Vineyards just hours before their 2014 Cabernet Franc Estate Reserve was being judged for the 2016 Virginia Governor’s Cup, and we found out later that evening that it won! It was pretty exciting to have the chance to get a sneak peek tasting before its official release. Keswick Hall itself originated from the beautiful Villa Crawford, a lavish Tuscan-style private residence built in 1912. Over the years, it was turned into a country club and then the world class five star resort it is today. Although I was on the grounds solely to visit the spa, I’m already planning a return so I can stay there, and spend time exploring the magnificent hideaway. But as for the spa, it was fabulous. I enjoyed a most relaxing Swedish massage, and it was completely customized to me. Afterwards I felt as if I had awakened from a blissful, restful slumber even though I had never fallen asleep. It was that relaxing. 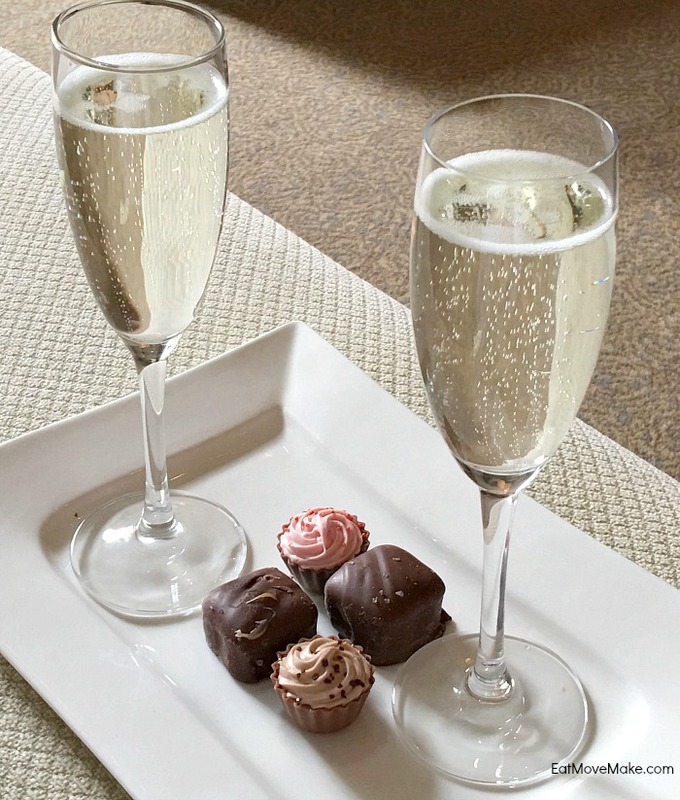 Not to mention that we were pampered with infused water, blooming hot tea and champagne with chocolates. 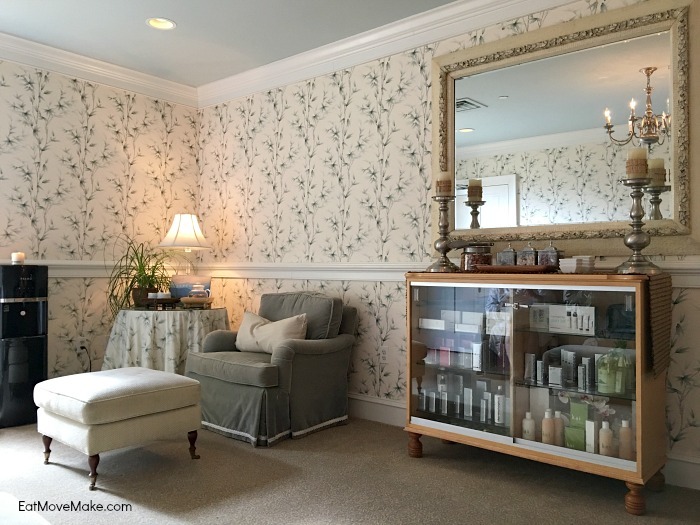 The spa at Keswick Hall treats you right. 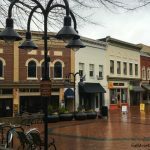 This Main Street brick and concrete pedestrian mall in Charlottesville extends a full eight blocks, and is just oozing with history and charm. 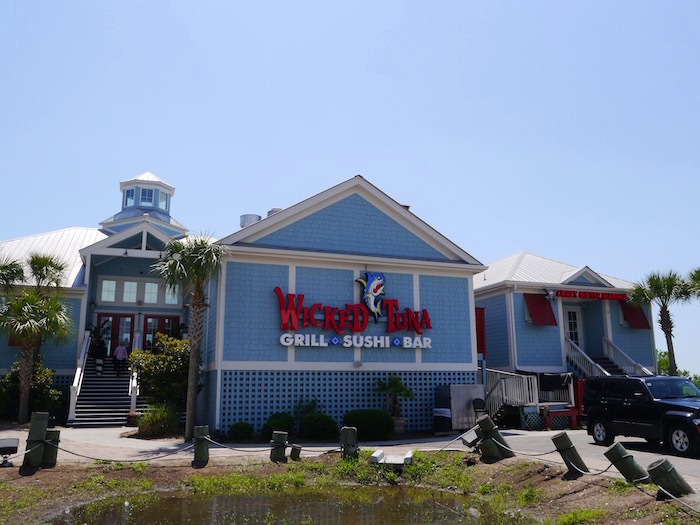 Home to over 120 shops and 30 restaurants, visitors can easily spend several hours poking around and exploring. 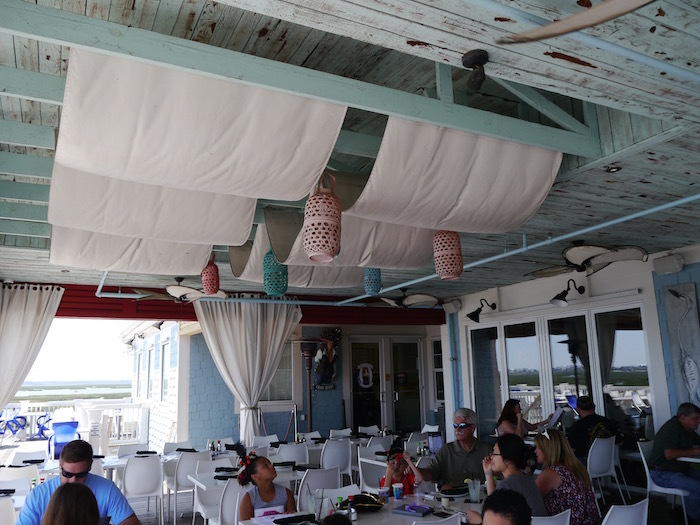 There are also lots of cozy seating areas to people watch, enjoy a coffee and cold drink or just enjoy the shade of the towering oak trees overhead. 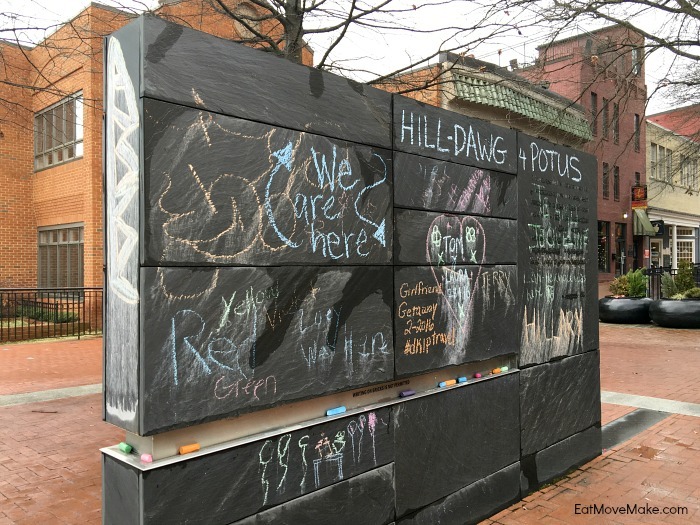 Don’t miss the Community Chalkboard, a freedom of speech wall on which the First Amendment is permanently inscribed and anyone can speak their mind via chalk art at any time. It’s worth a visit and perhaps your two cents. Also in the downtown mall are an ice rink, a children’s museum and a restored theater. Visitors can park in nearby parking garages or lots, and a trolley connects the downtown mall to the University of Virginia. 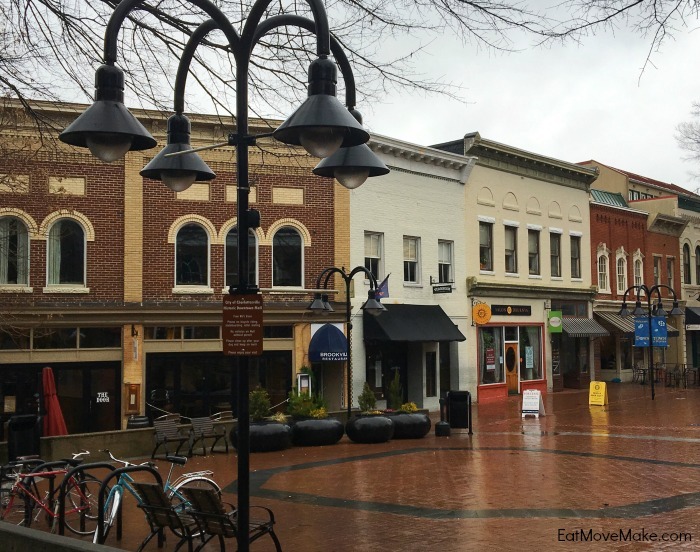 The downtown mall is an absolute can’t miss when visiting Charlottesville. 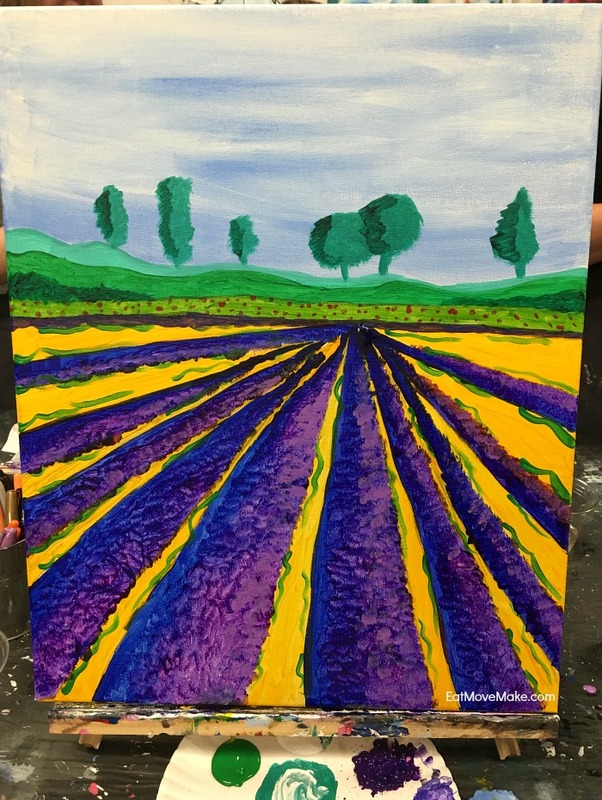 Bring your own wine and your girlfriends to this evening painting party and class for a 2-hour artistic adventure. 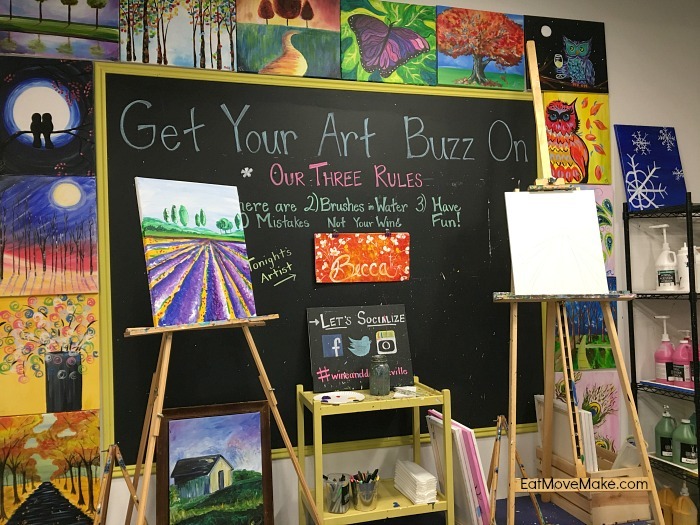 You’ll start with a penciled-on template on an otherwise blank canvas, and with easy-to-follow instructions, you’ll leave class with a painting. 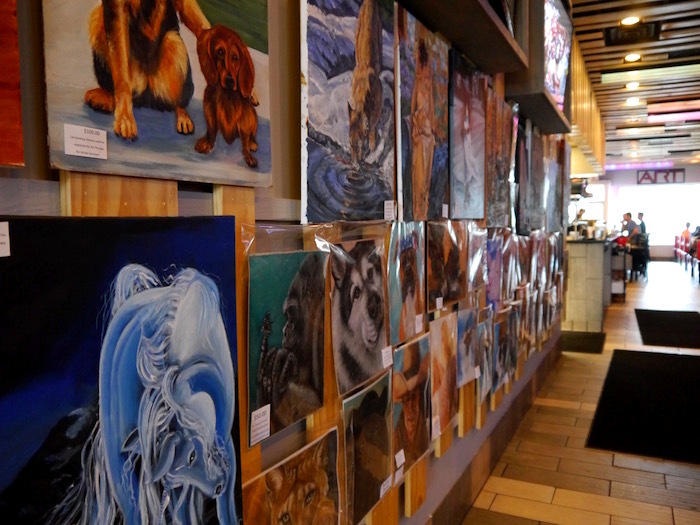 The #1 rule is that there are NO mistakes, so everyone’s painting will have a unique look. 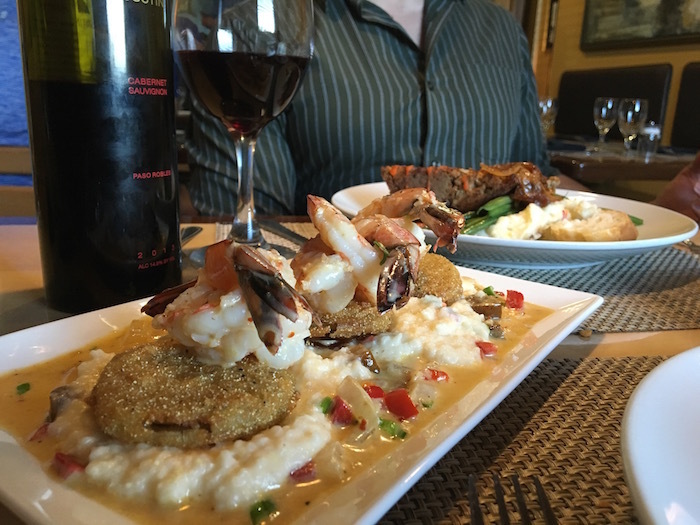 That’s what makes it so fun… well, that and the wine. 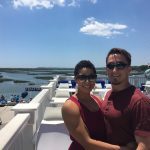 It’s a perfect girlfriend getaway activity! So there you have it. 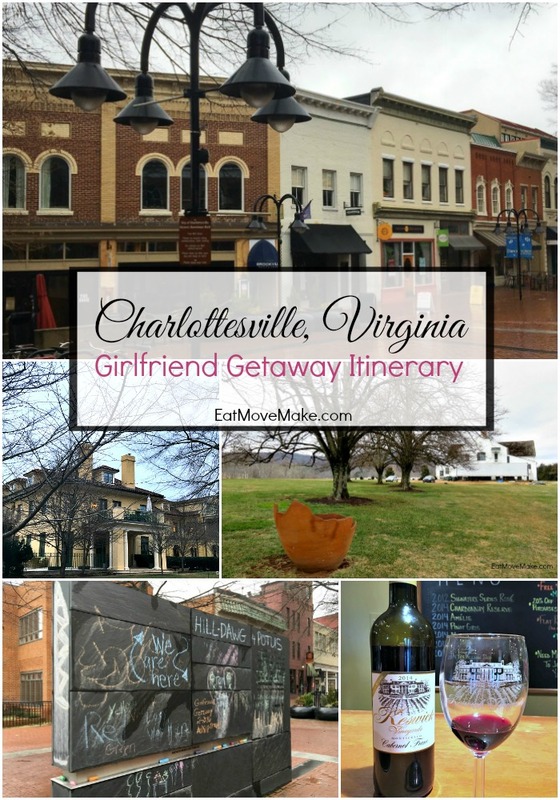 Proof positive that Charlottesville makes a great girlfriend getaway destination! 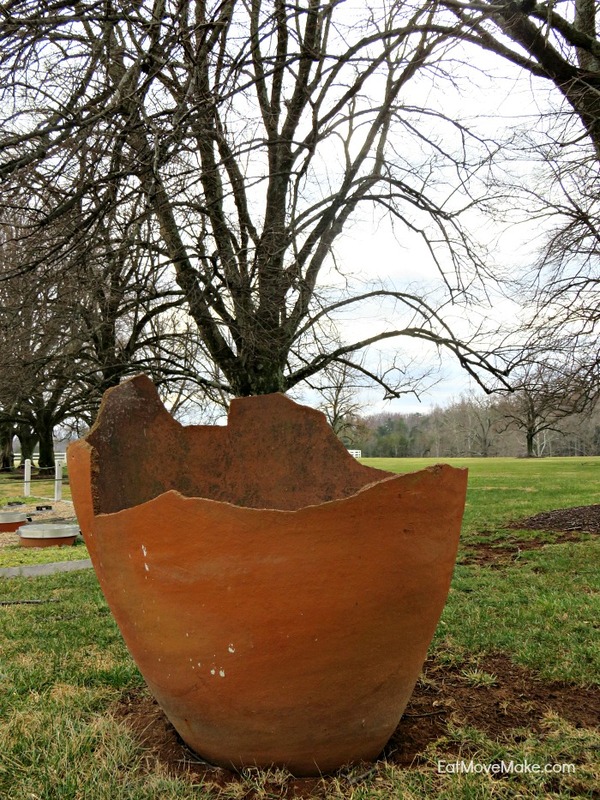 Stay tuned for the artisan trail post, ideas on where to stay, where to eat and a visit to the area’s historical gems. I recently went on a five-day girlfriend getaway with three dear friends of mine, and it was one of the best escapes I’ve ever had. When you’re with people you love, everything is more fun, and when you add a special wine into the mix, it elevates it yet another notch. 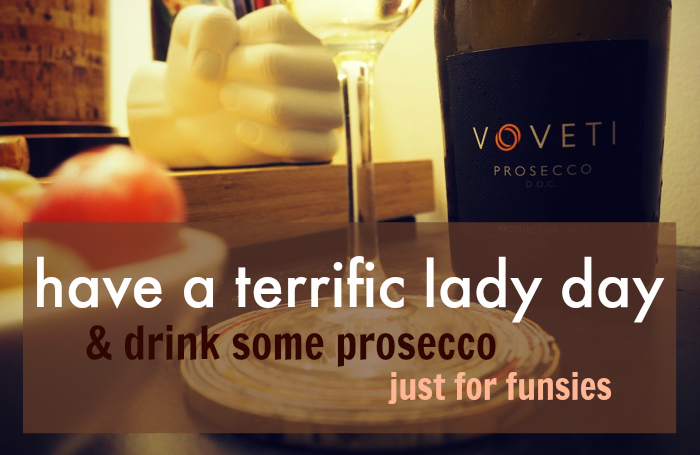 Have you ever tried Prosecco? It’s a sparkling white wine that’s very light. In fact, it’s fast becoming as “everyday” as white wine itself, and if you know me, you know I love my white wine… Pinot Grigio, to be exact. But Prosecco is right on its heels. I first discovered Prosecco when my sister brought a bottle to our family Christmas party, and I never looked back. 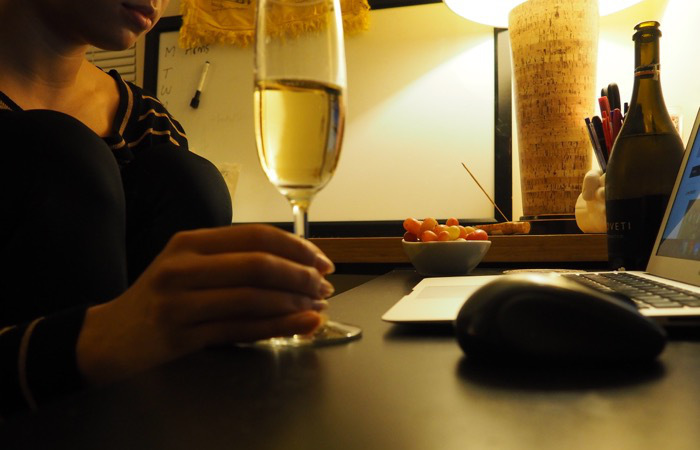 Whether I’m out to lunch with my girls, having a romantic dinner with my guy or kicking back while watching The Bachelor, Prosecco is often a part of it. Look at those bubbles… how can you not love bubbles? And Prosecco is so versatile that it easily fits into every occasion, whether you’re relaxing on the beach watching the sun set, hanging out with friends or enjoying a romantic evening with someone special. Brunch Add bubbles to breakfast by mixing up a delicious Prosecco cocktail, the Bellini. Made with peach puree, it’s a wonderfully refreshing morning drink. 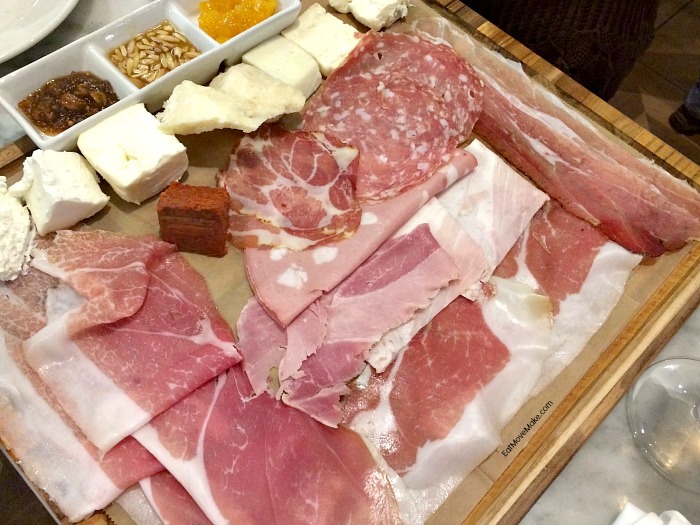 Charcuterie Prosecco pairs beautifully with cured meats and rich cheeses. 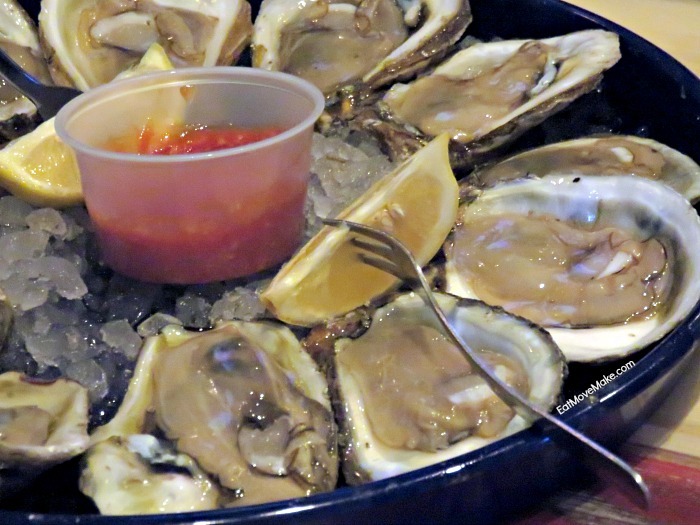 Salty snacks – Try nuts, popcorn, pretzels and chips. 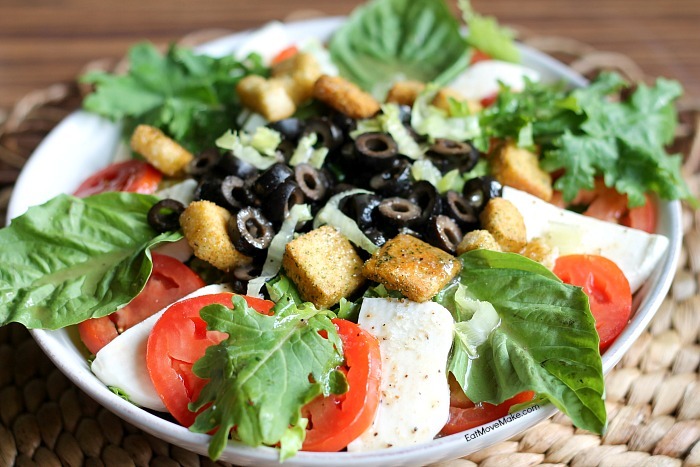 Caprese Salad – You can serve Santa Margherita Prosecco or Santa Margherita Pinot Grigio with this salad. I love them both! 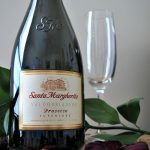 Did you notice I’ve been strongly hinting that Santa Margherita USA is the brand to try? There’s a reason for that. 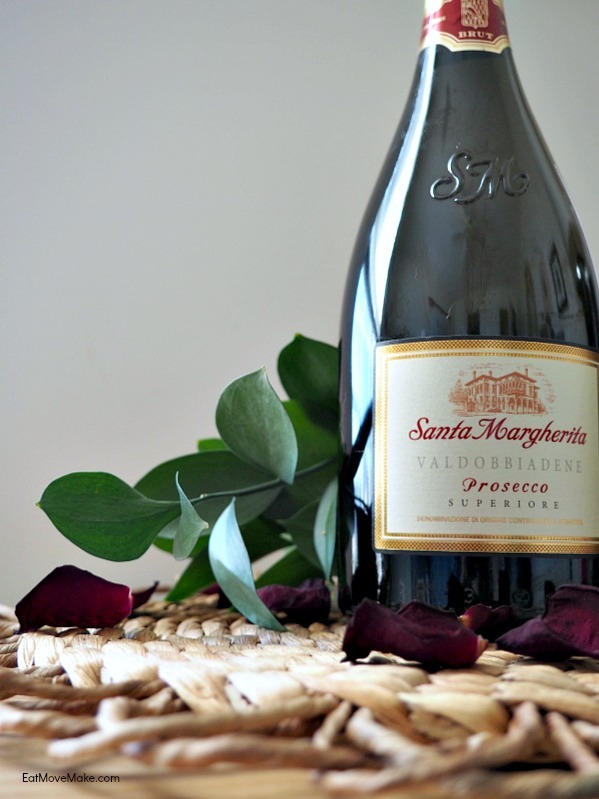 I’ve been sipping on Santa Margherita’s Pinot Grigio for years, but the Prosecco is brand new to me. I didn’t even know they had it until recently! 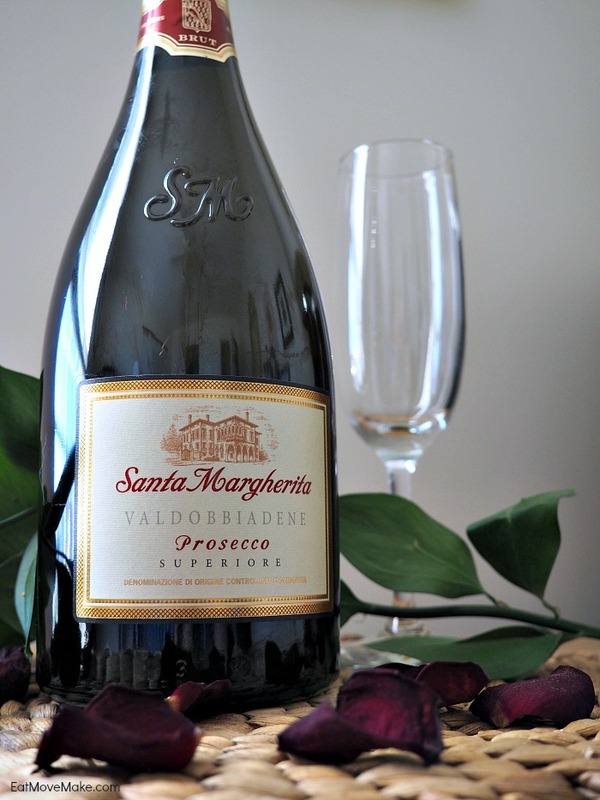 Santa Margherita has a long-standing tradition of being a classic and elegant Italian wine brand with a versatility that makes it perfect for every occasion. 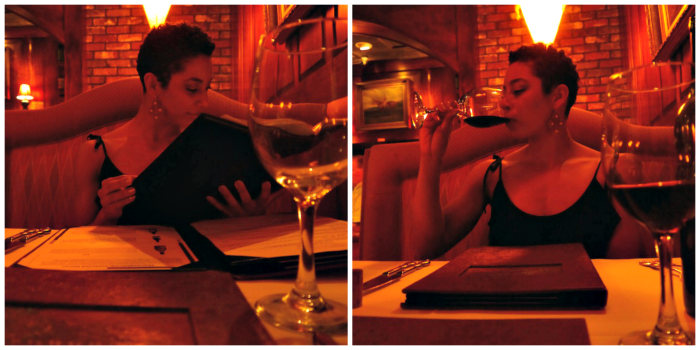 It embodies everything I love about wine, and it’s perfect for enjoying life to its fullest with those I love most. Visit @SantaMargheritaUSA on Instagram and @SMWinesUSA on Twitter. 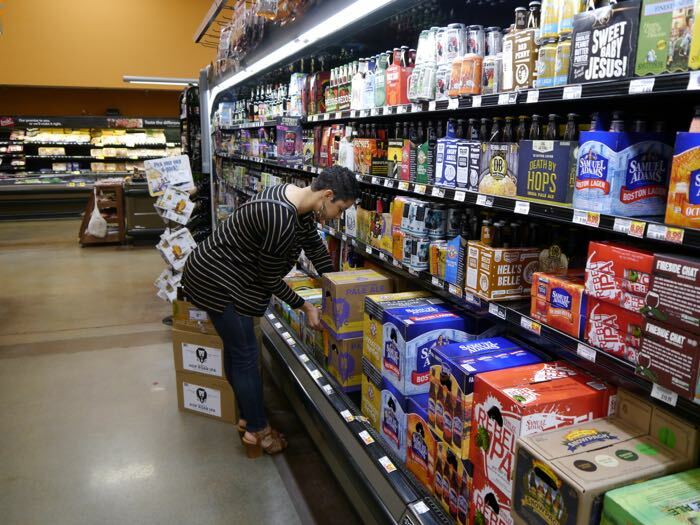 For the holidays, my favorite gifts to give are things that are either practical, something someone will use every day, or consumable, like beer, wine, coffee, or treats. So I guess that means a practical gift that holds wine is the ultimate gift, right? Wine glasses for everyone! I had the opportunity to try out a set of red wine glasses from the Libbey Perfect Signature Collection. I chose a set of four Auden Grande balloon glasses, which are intended for red wine – I’m a red wine girl all the way! You could give a set of these glasses to a new couple who are settling into a new home, to the hostess of an upcoming holiday party…the possibilities are endless! So although they would make a perfect gift for anyone on my holiday list, I am selfishly keeping them for myself. Why? The glasses are beautiful and stylish and make me feel like a fancy lady. Libbey Glassware is made in America and has a 25 year guarantee, so this set will last me a very long time. 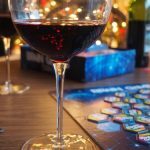 The other night, we decided to pour ourselves some wine and have a family game night. 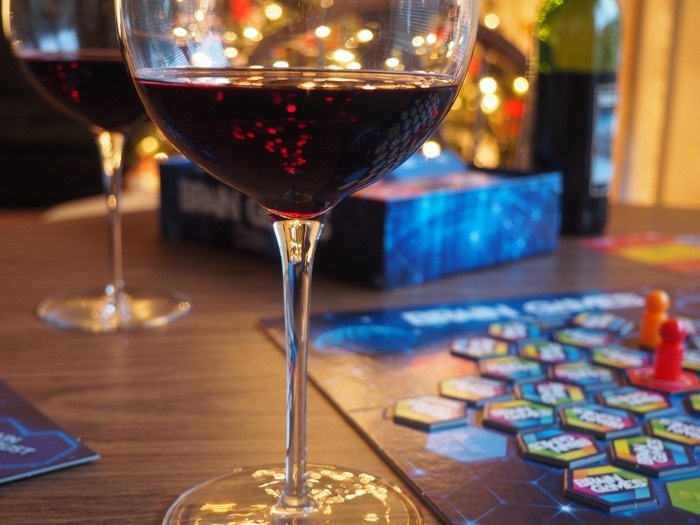 This time we tried a brain-bending game and had tons of laughs as we tried to spit out the answers to puzzles after a few sips of wine. It was fun spending quality time with my fam and it made me daydream about hosting gatherings at my place in the future! And what kind of gathering would it be without wine served in my best glassware? The Perfect Signature collection, including these supa stylish Auden Grande red wine glasses, is available at BedBathandBeyond.com and select in-store locations. For more information about the collection, you can visit Libbey’s website here! 30% discount bonus offer! Purchase any Libbey Perfect Signature glassware set at Bed Bath & Beyond and share a photo by January 30, 2016 to receive a 30% off coupon for your next purchase at Libbey.com! On Twitter, use #CelebrateThis and tag @LibbeyInc. 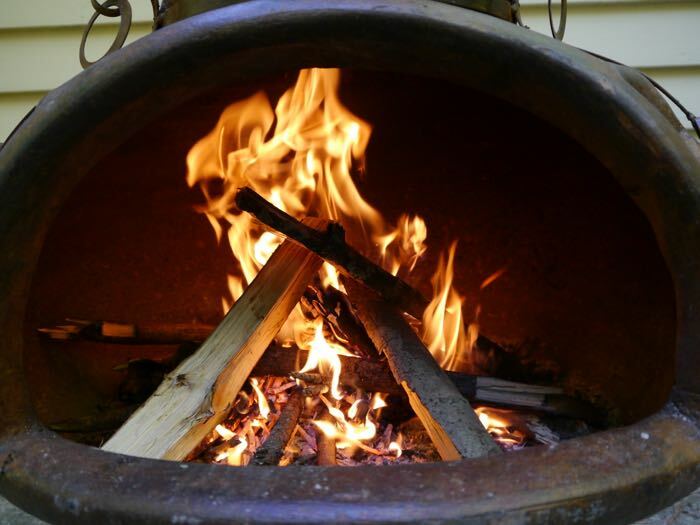 On Facebook, share the photo to the Libbey Facebook page. Have you guys ever watched The League? I wrote about how awesome it is a couple of months ago. 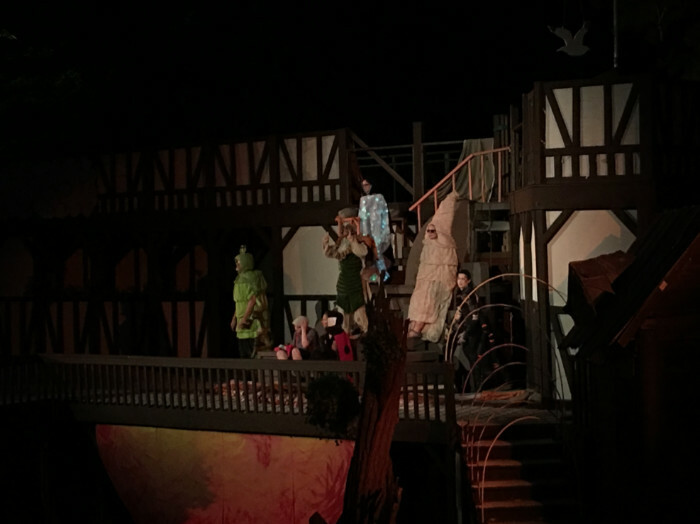 Anyway, there are several husbands in the show and one of them is generally messing up with his wife. 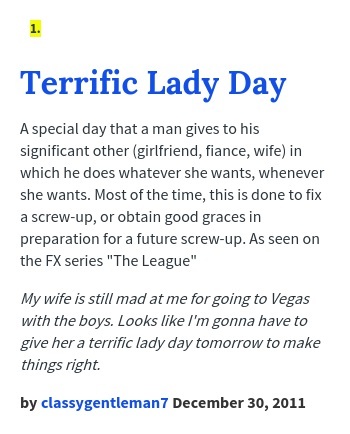 One guy, Ruxin, starts treating his wife to a “Terrific Lady Day” every now and again, where she gets to do anything she wants and doesn’t have to talk about football at all. 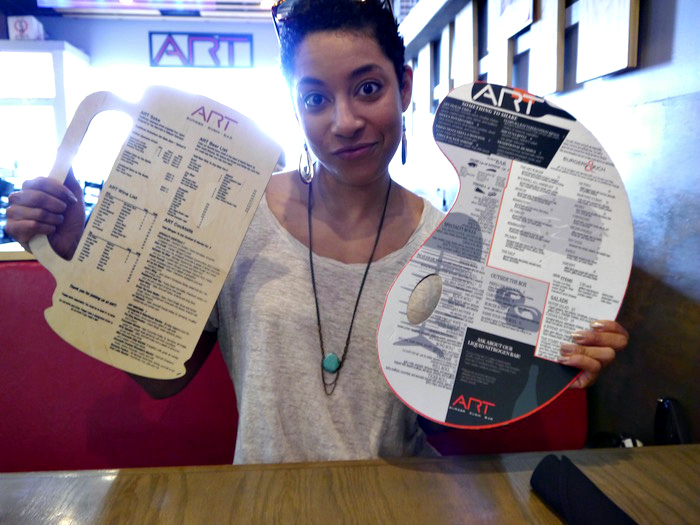 But I’m thinking, why not treat yourself to a terrific lady day whenever you want? I like to do this often, and I sometimes also call it “doing Chanelle stuff”. I had a terrific lady day the other night for no reason at all. It was extra terrific because it included a bottle of VOVETI prosecco, and I never turn down a glass of bubbles. 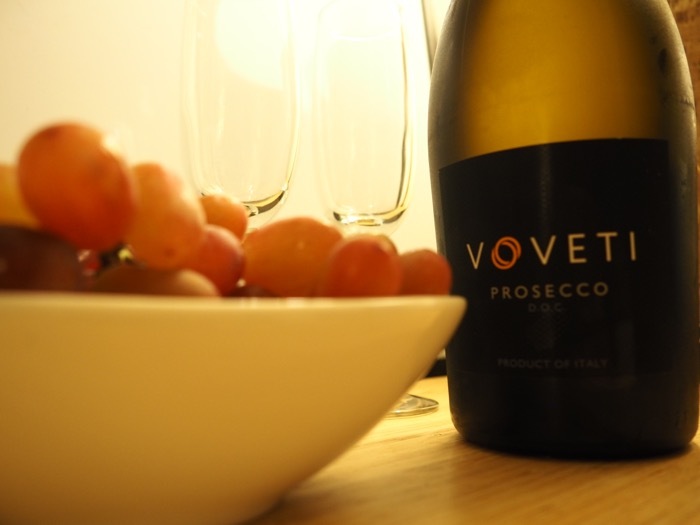 VOVETI is a craft prosecco, and there are only 15,000 cases produced each year. 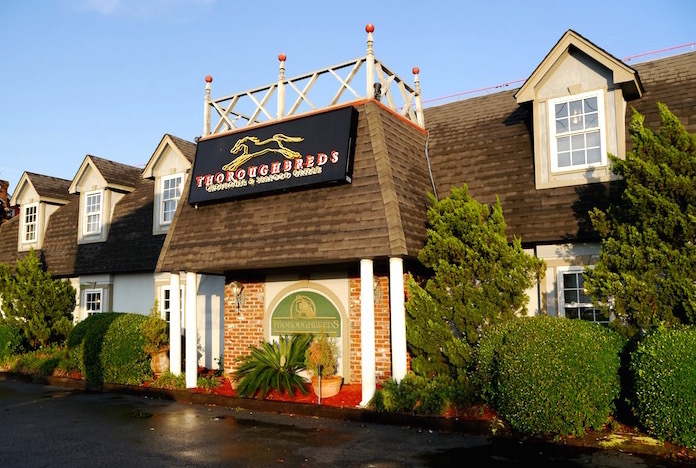 But still it manages to be both upscale and affordable (under $20!) so you can have your cake and eat it too, so to speak. So on my terrific lady day, I didn’t do anything too crazy. I just spent some relaxing time doing a few things I enjoy doing. I washed my makeup off and put some leggings on. I made a little plate of grapes. 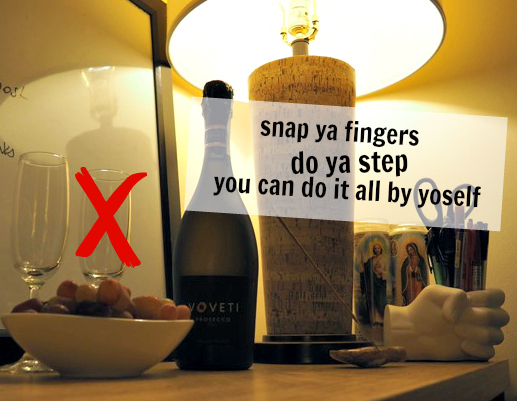 I poured myself some VOVETI prosecco. It was light, crisp, and fresh. I loved it. I turned on my most relaxing playlist, which is entitled “Soporific Schlombola“. << Click to listen if you have Spotify! I lit some Nag Champa incense. And I got some writing done! 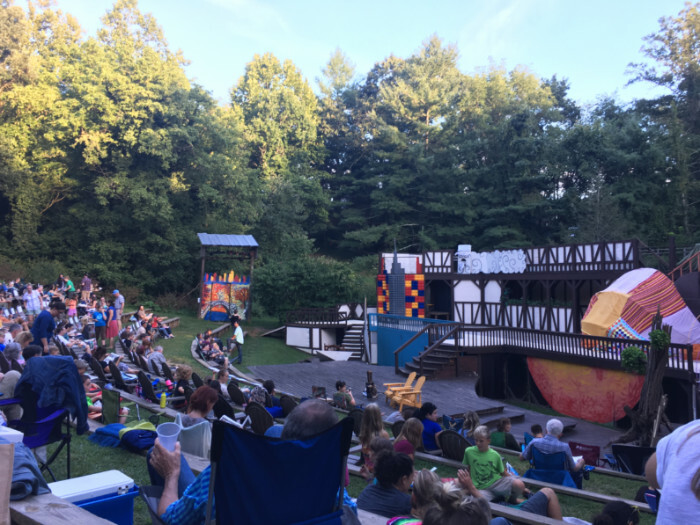 It was a really refreshing way to spend a weeknight and was a good reminder that spending a night here and there in my own company doesn’t make me a lonely spinster, it makes me a super terrific lady. 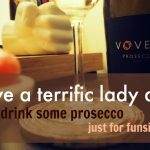 Go get yourself some VOVETI prosecco and have your own affordable & luxurious terrific lady day! My favorite part about Thanksgiving isn’t the turkey, although that is mighty tasty. It’s the cranberries. There’s just something about those red, tart berries that brings a warm Thanksgiving feeling to my heart. 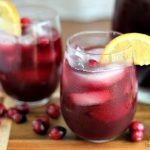 Every year I make a homemade cranberry sauce (and I will again this year), but I also decided my favorite seasonal berry needed a bigger role in the holiday menu– as a cocktail. 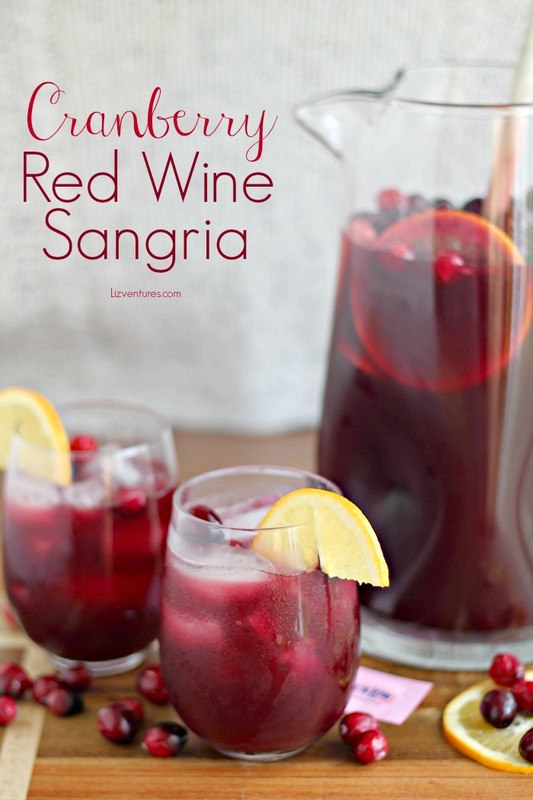 So, I’m serving this Cranberry Red Wine Sangria recipe with Thanksgiving dinner. 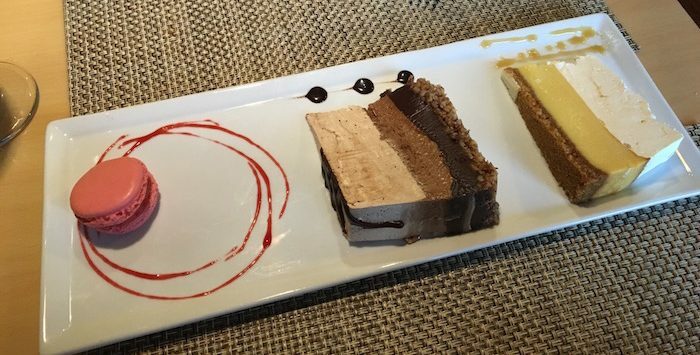 It’s the perfect way to sweeten up Thanksgiving, don’t you think? 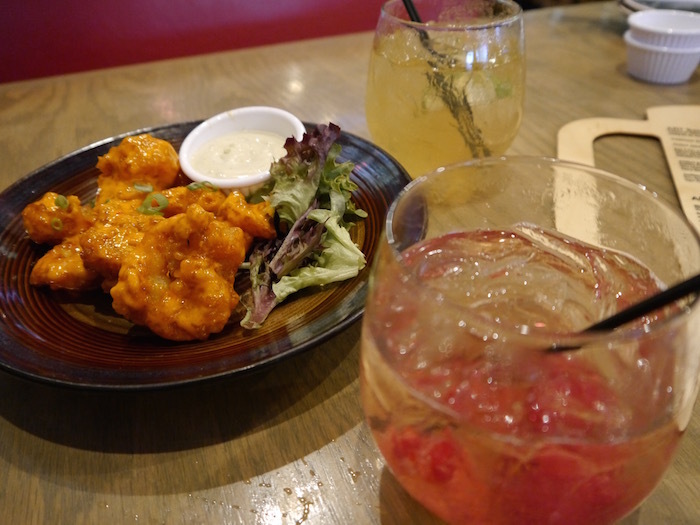 Doesn’t it look refreshingly delicious? 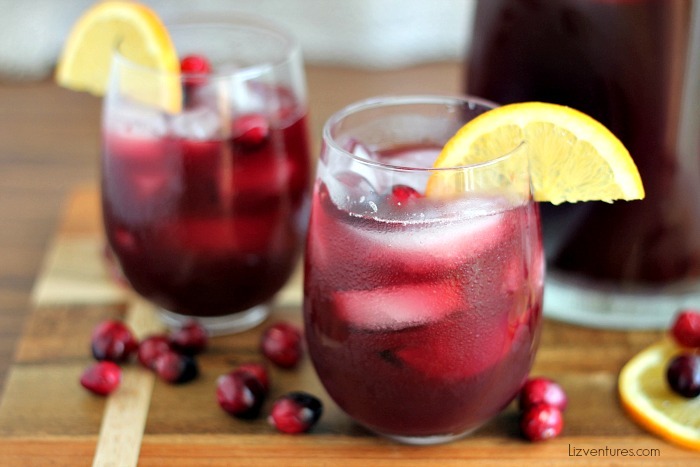 After slaving away in a hot kitchen all day roasting a turkey with all the trimmings, a sangria will hit the spot like nothing else. I like to make it the evening before and let the flavors mingle in a pitcher in the fridge until it’s served the next day, but if you’re an early riser, you could make it in the morning to have ready for a mid-afternoon meal. 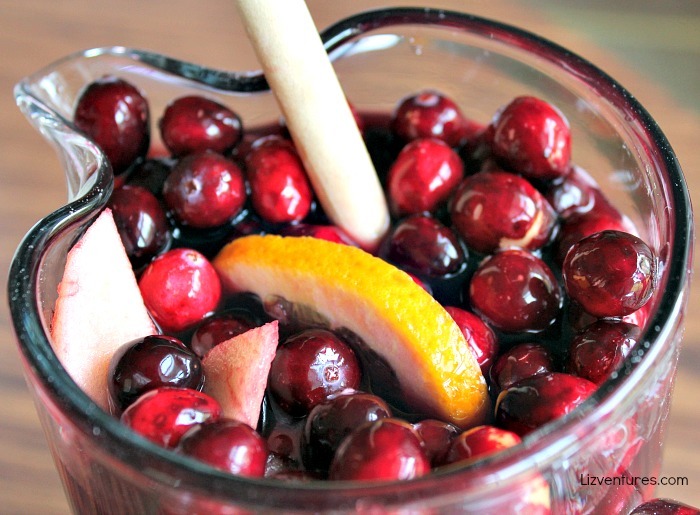 I mix a bottle of Malbec, cranberry juice and orange juice in a pitcher. 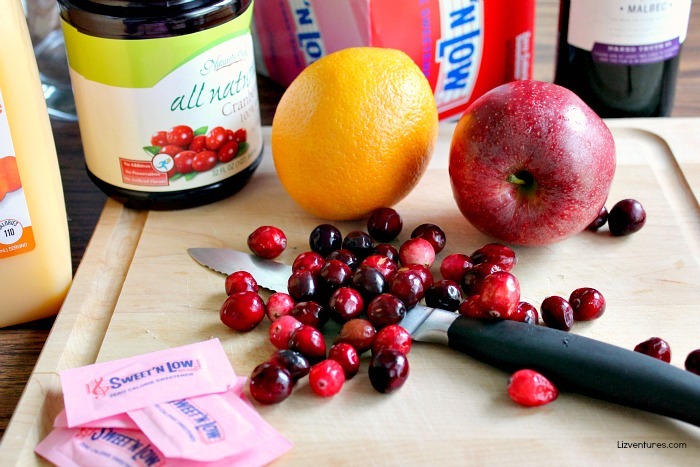 Then I add some fresh cranberries, orange slices and apple slices before letting everything infuse in the fridge overnight. The next day, I give it a good stirring and pour over ice in individual glasses to serve. It’s the perfect way to sweeten up Thanksgiving! My boyfriend and I are creatures of comfort. Board games, movie nights, and lazy Sunday mornings are some of our fave things to do. 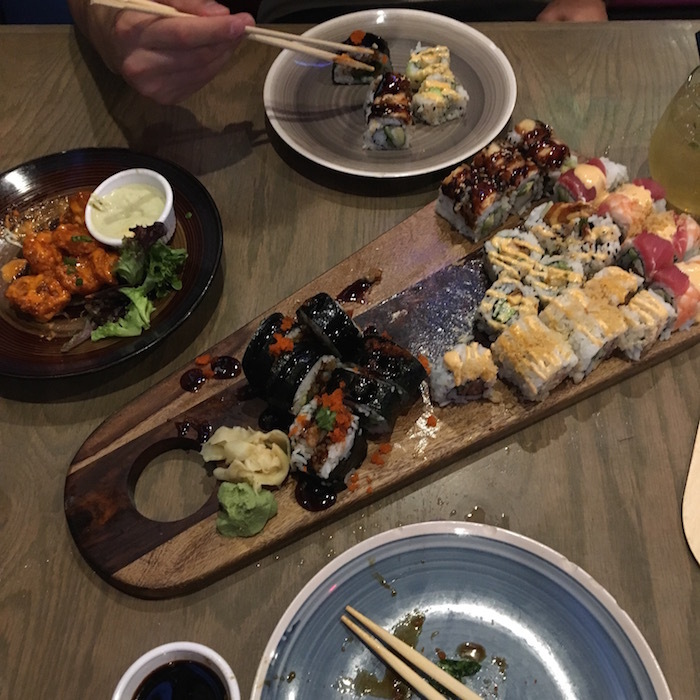 We do love going out to bars and restaurants, too, but we made a pact to only eat out if it’s a good value, if the experience is unforgettable, or if we’ve had a hankering for something in particular. 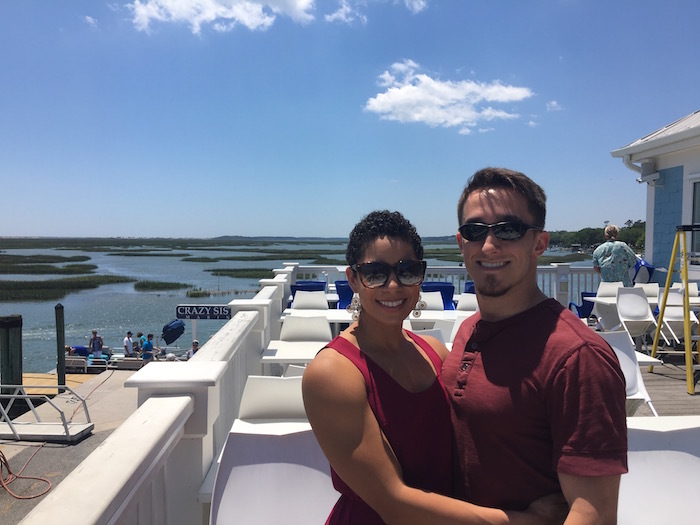 With our philosophy, we’re saving a lot of money that we can apply to something responsible like student debt, or to something fun, like vacations. 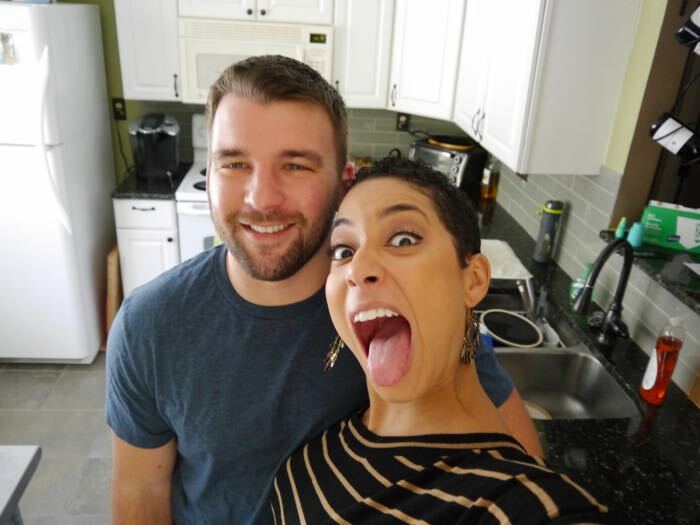 And we’ve also been doing a lot of cooking at home, which is fun to do together and has resulted in lots of new favorite recipes and food & wine pairings. 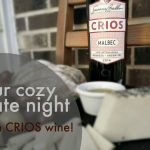 Both of us like wine, but neither of us is an expert, so partnering with Crios and trying one of their wines was a cool opportunity to be a little more intentional about what we eat with our wine. Crios, meaning “offspring” in Spanish, is a family-owned brand by Susana Balbo, created as a tribute to Susana’s son, José, and daughter, Ana. José and Ana have both joined the business and add their young-adult point of view to the wines that are dedicated to their family bond. I can totally relate to that – as you know, I went into business with my mom too! All Crios wines are harvested from specific areas in Mendoza and Salta in Argentina, where grapes are optimal for the fruit-forward style of Crios. 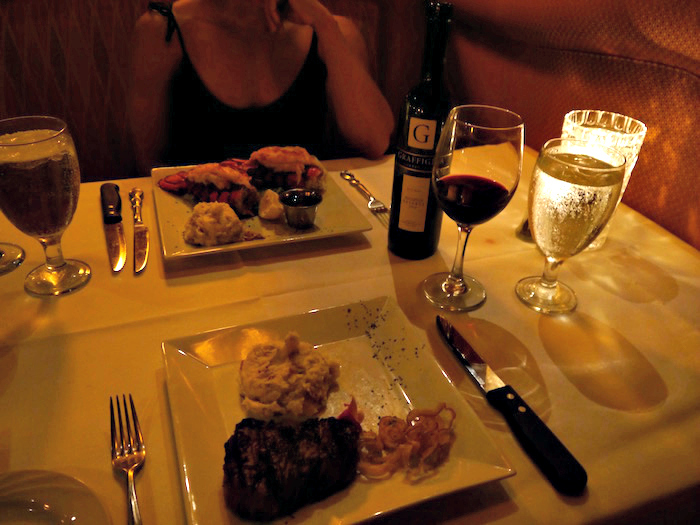 Before we could drink the wine, though, we had to get the rest of our date night fare ready. 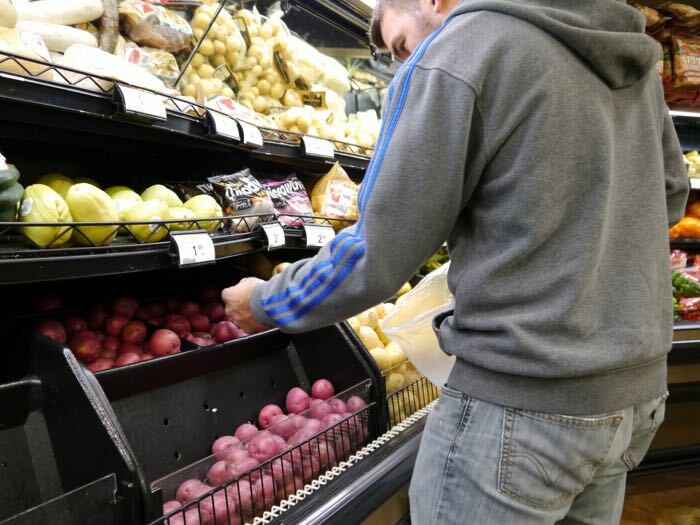 So, it was off to the grocery store, but not before taking a selfie. 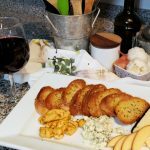 For our date night in, we decided to do an hors d’oeuvres plate to have with our Crios Malbec in front of the fire that afternoon, watch the Penn State/Ohio State football game, and then cook dinner a little later. After that, we planned to end the night with a movie. One new recipe and one old recipe were on the menu for that night. We’d made this brown sugar and rosemary porkchop recipe once before and adored it, and we saw this braised red potato recipe on an episode of America’s Test Kitchen and thought we’d try it out! 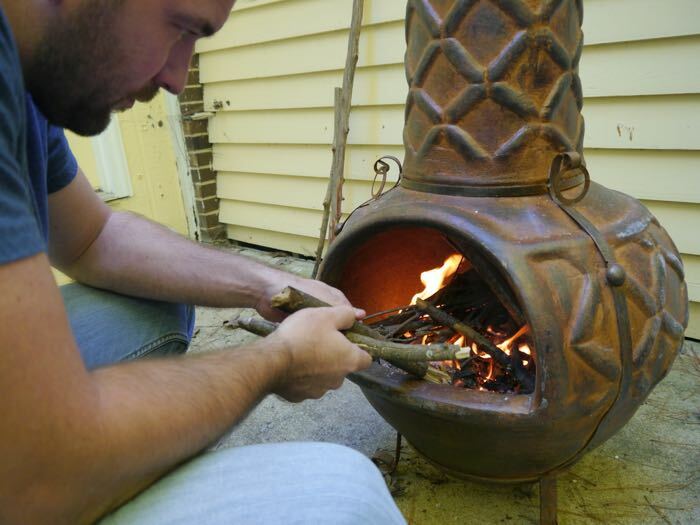 Once we got home from the store, my boyfriend got a fire going in the new chiminea he bought for us to enjoy this fall! 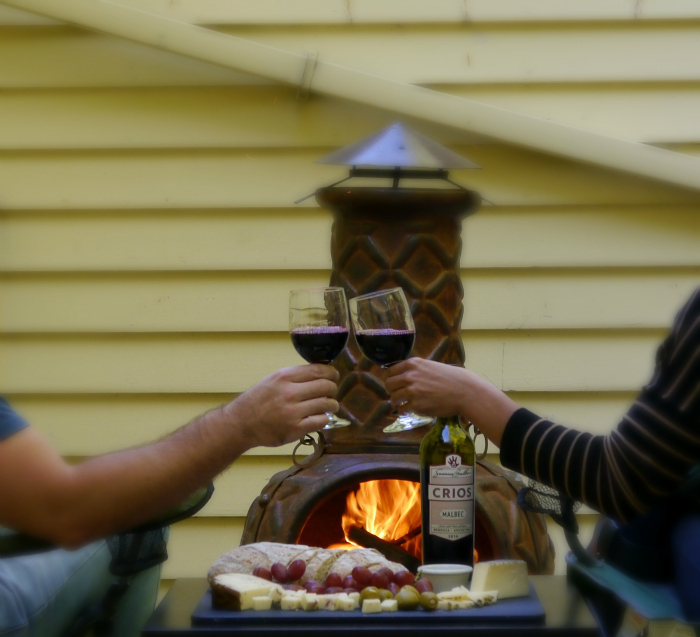 Once the fire was roaring, we put together a nice little platter of cheeses, bread with olive oil for dipping, grapes, olives, and of course the lovely bottle of Crios. I love their modern label design – anything with stripes is a win in my book! 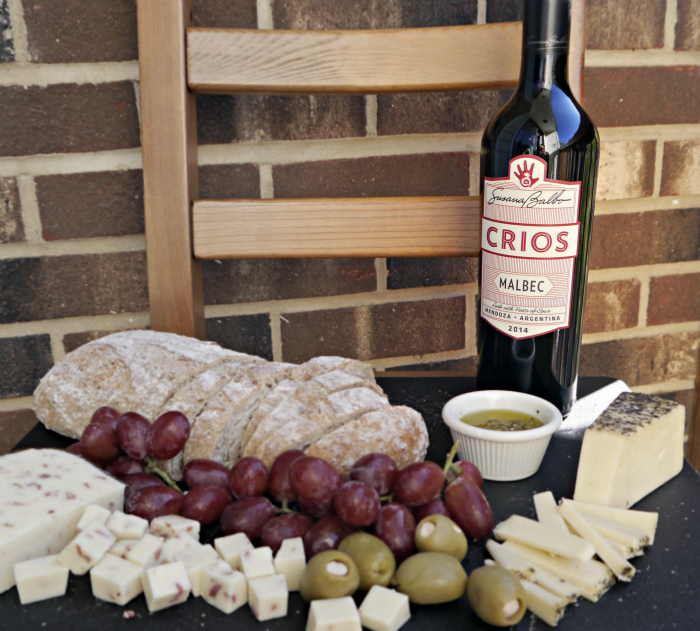 Crios Malbec was created when Susana Balbo, Argentina’s leading and most innovative winemaker, was inspired to change the perception of Malbec from a forgotten grape to Argentina’s iconic varietal. It’s velvety, slightly spicy, and full of signature notes of black cherries, oak spice, and violets. This wine definitely elevates Malbec to world-class quality. It’s great to pair with things like tuna steak, lamb, and hamburgers, but my boyfriend and I took a page out of Susana Balbo’s book and bravely paired it with these little bites instead…and then bravely polished the bottle off almost as soon as we opened it! Oops. We poured ourselves glasses of the gorgeous, inky-purple Malbec, toasted to a great weekend, and enjoyed our appetizers in front of the fire. 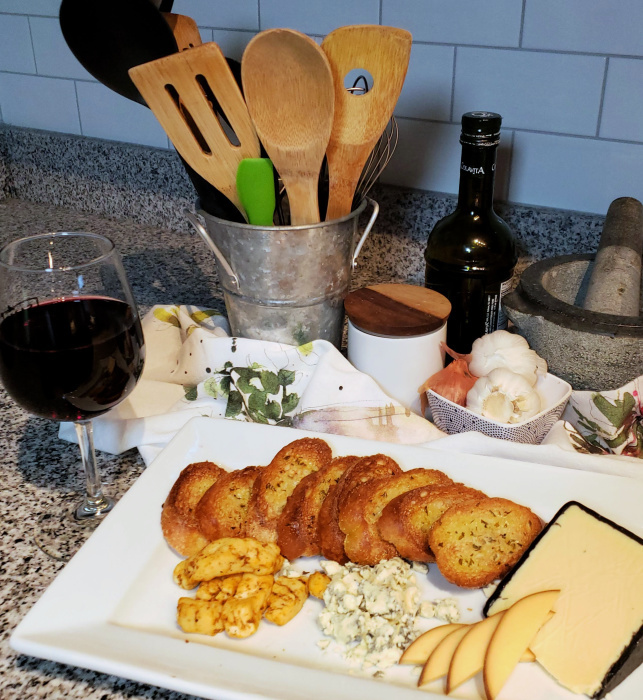 I picked the Malbec for us to try because I love a full-bodied red wine, and it was a great choice – it’s lush with hints of spice, and stood up perfectly to the flavorful cheeses (a horseradish cheddar and an herbed asiago) and hearty loaf of bread. Later that night, we tuned in for the Penn State vs. Ohio State football game. The stakes were high because those are our alma maters! Naturally, we bet against each other. Guess who won…muahaha! We worked up a hunger with all that yelling, so after the game it was time to make some dinner. The porkchops turned out perfectly, just like they did the first time we made them, and the braised potatoes were excellent. Definitely a new favorite. And finally, for our nightcap, we (yes, two childless adults) chose to watch Penguins of Madagascar in front of the fire, but indoors this time. The movie was hilarious and you should watch it! Are you a red wine or white wine person? Have you ever tried a Malbec?